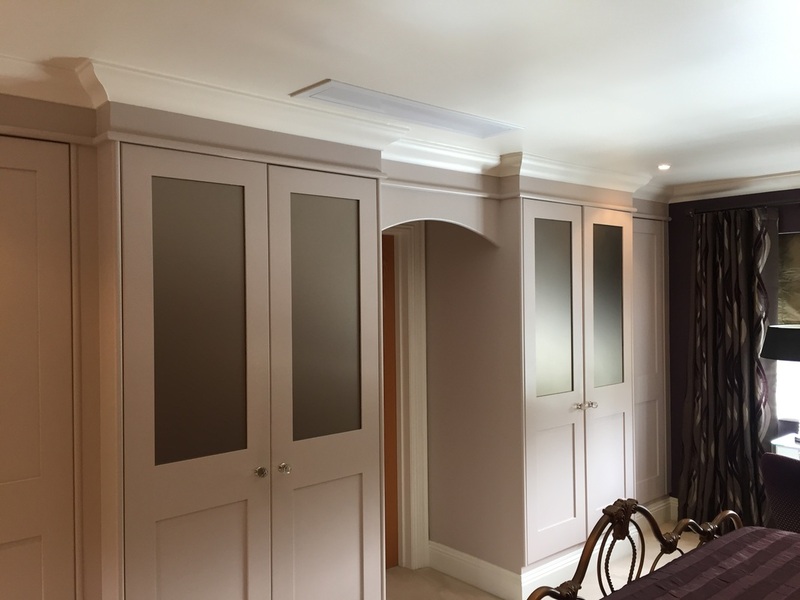 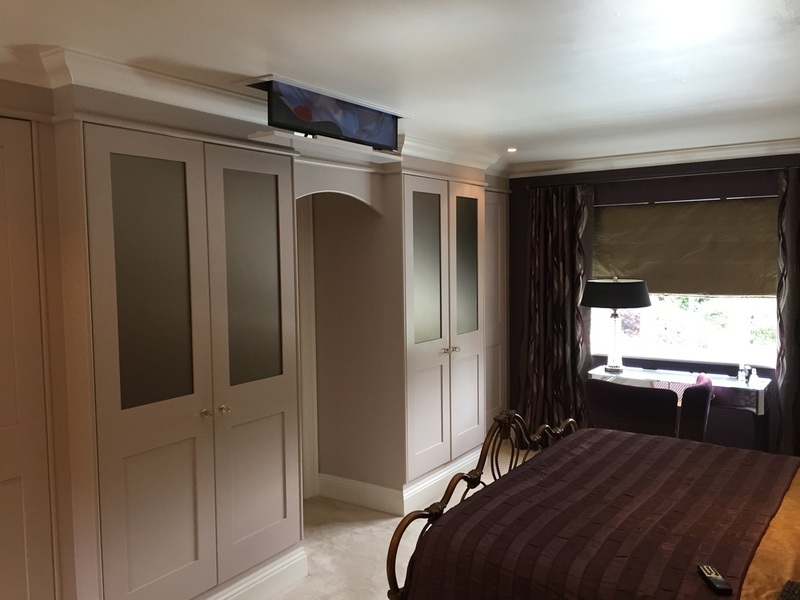 Most of the installations below fall into the custom installation bracket whereby I would normally quote before fitting, why not email me a picture of your room/project and description of what you would like to achieve, so I can provide you a brief quotation before I visit your property. 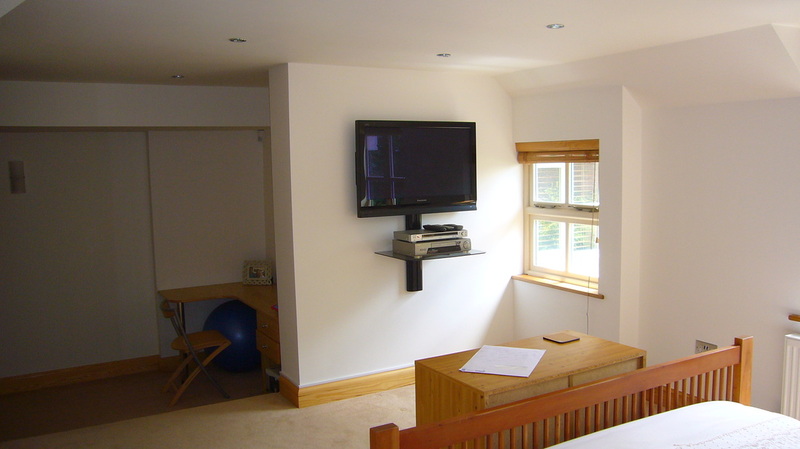 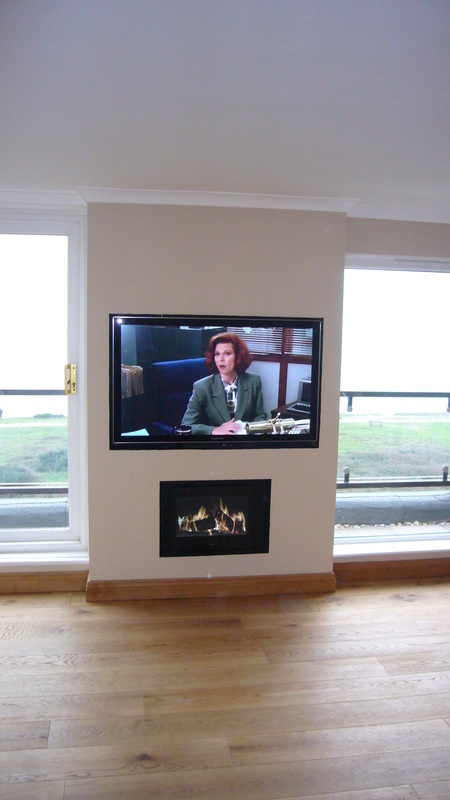 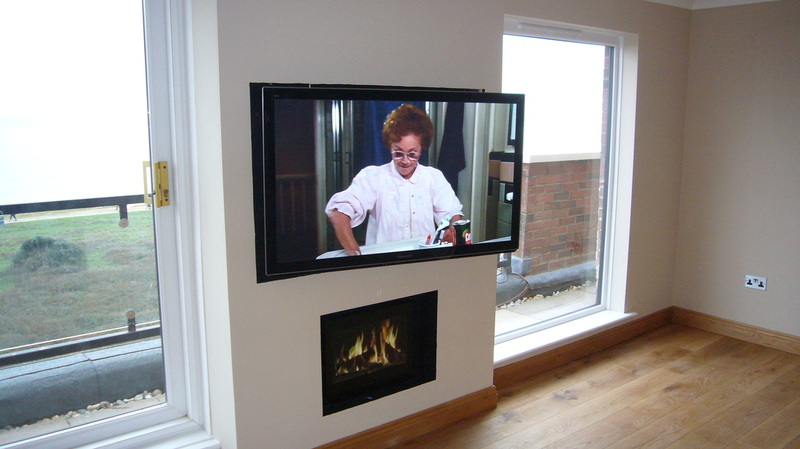 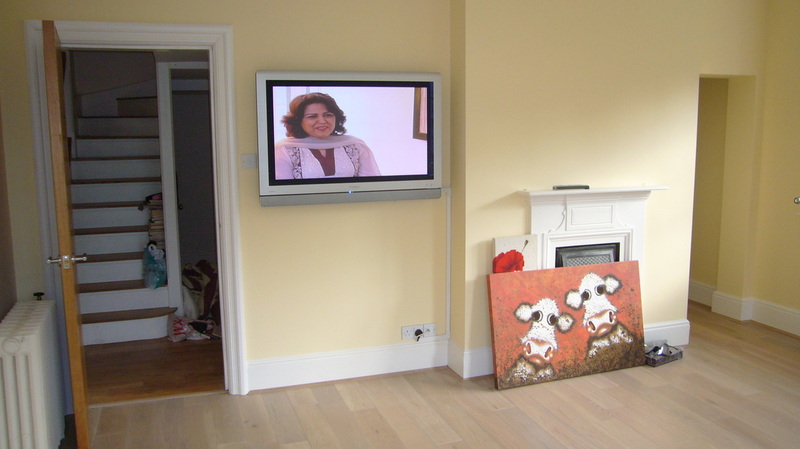 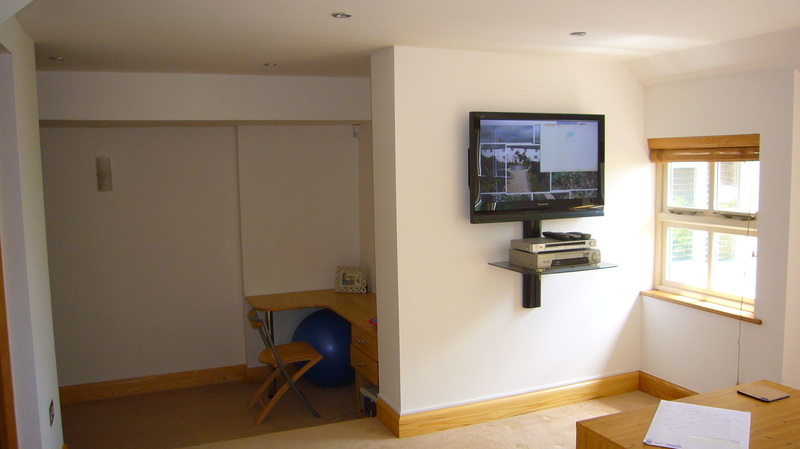 A custom made ceiling lift to hide a 40" LED TV, mounted within the loft void when not in use and then electronically lowering to suitable viewing position when in operation. 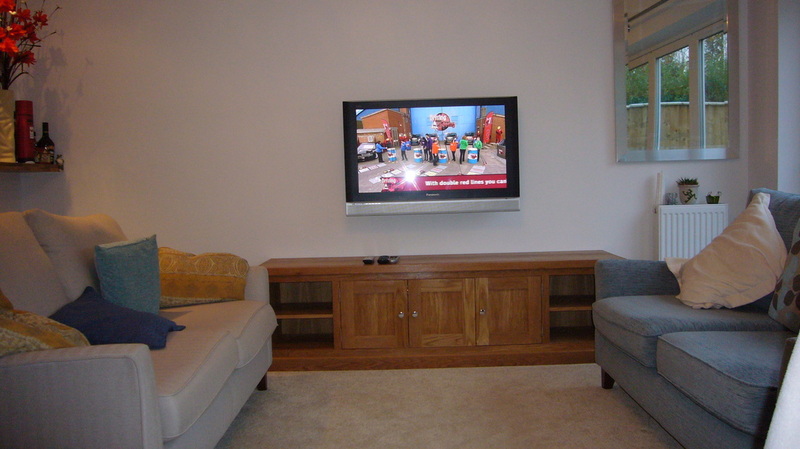 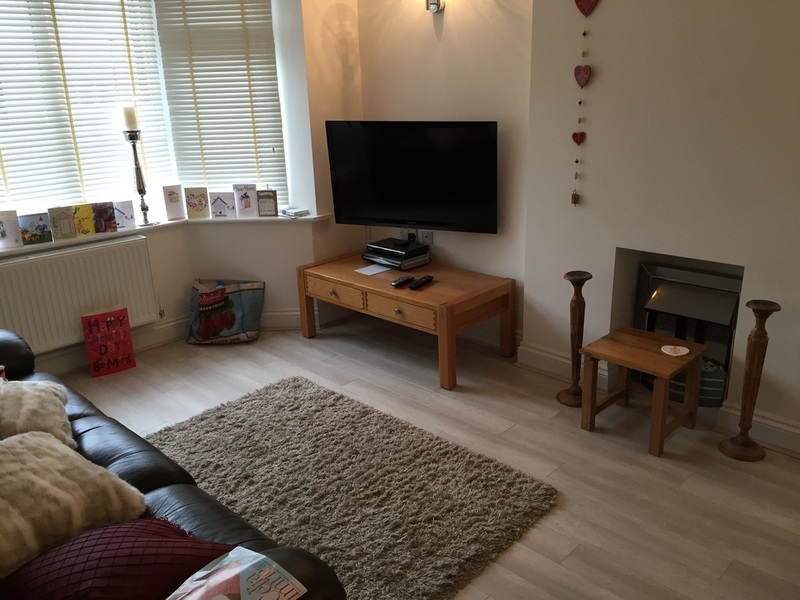 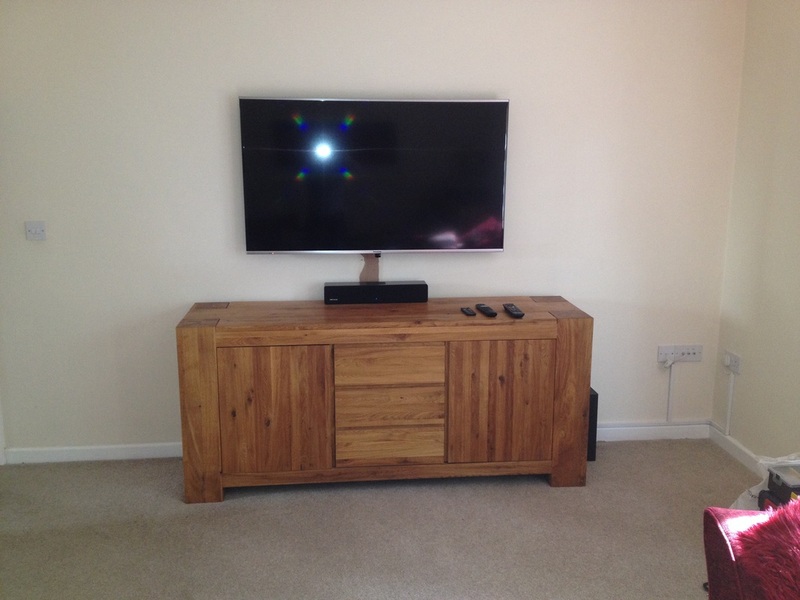 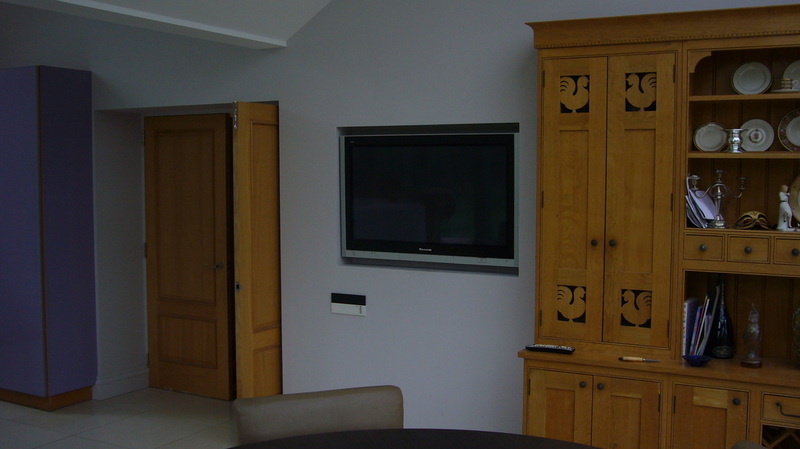 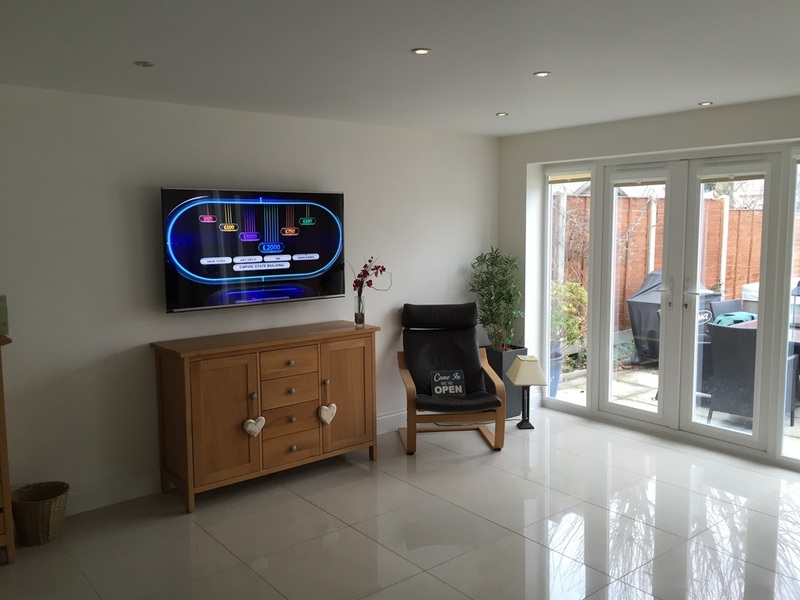 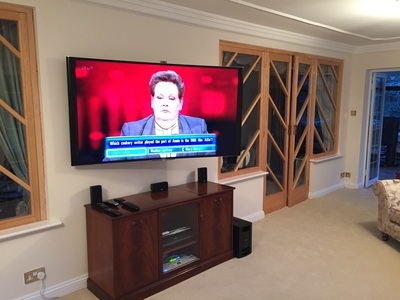 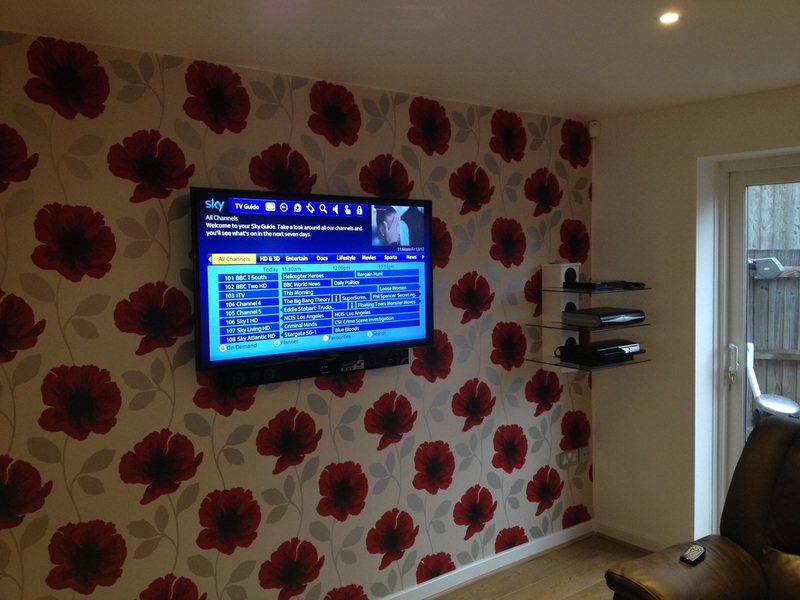 The TV had the ability to access the internet for catch up services, access to Sky box in HD located in another part of the house and Freeview HD services via conventional TV aerial. 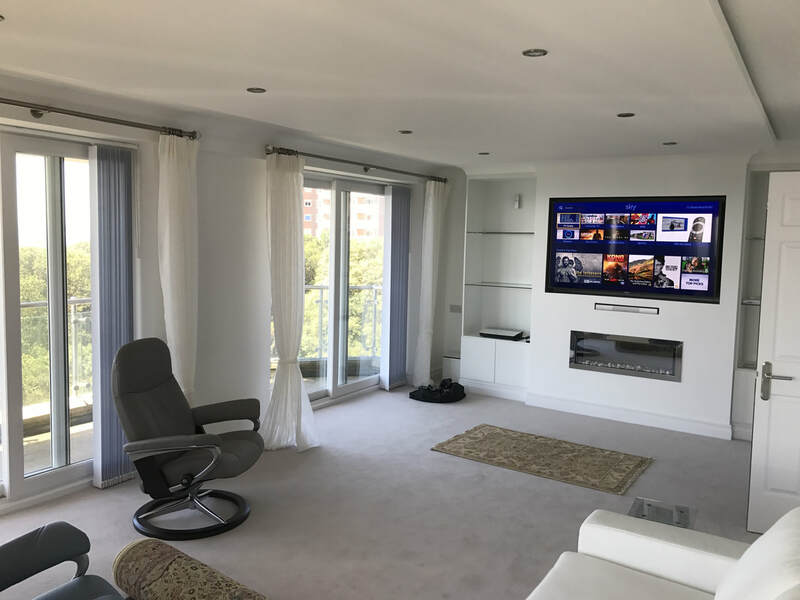 A custom installation in conjunction with builders / furniture builders to install a 65" LED Sony TV, Sky Q receiver, Sony Blu ray player and Bose 5.1 home cinema system with discreet wall mounted speakers. 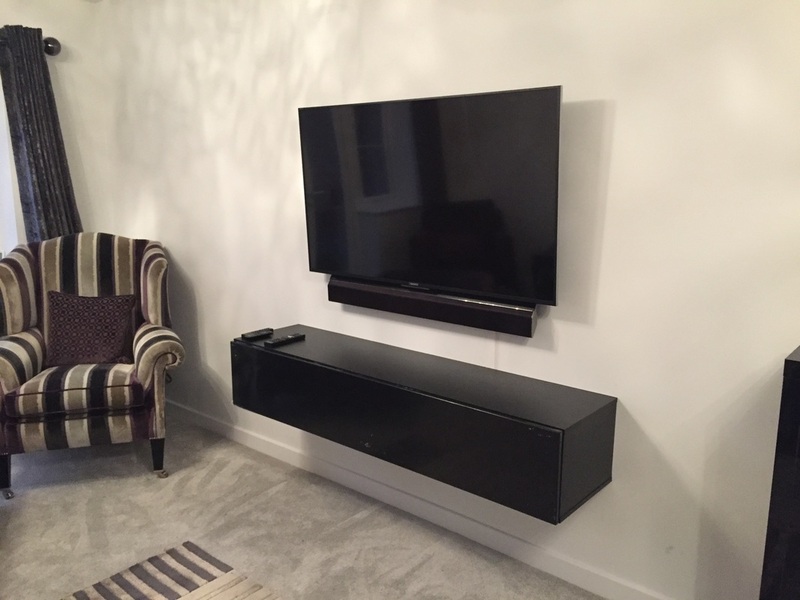 Sky Q receiver and Blu ray player to be housed inside furniture, all speakers to be wall mounted and hidden. 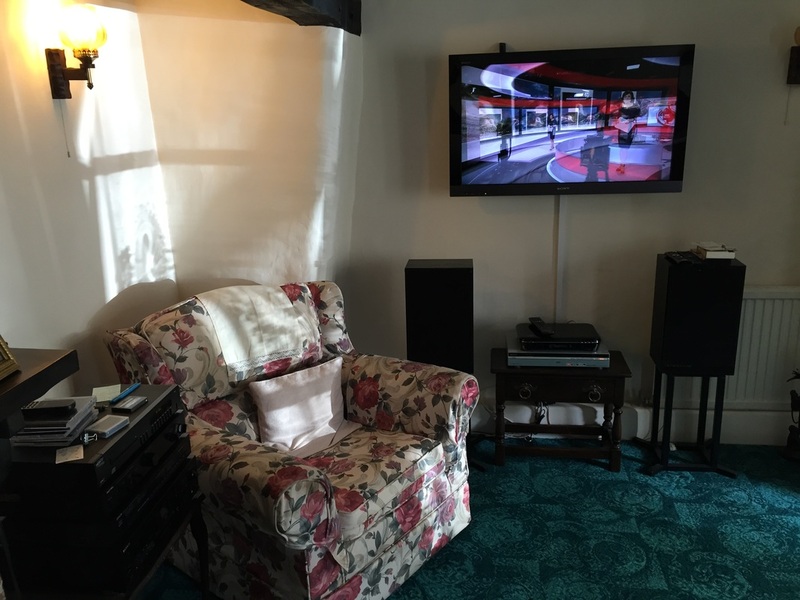 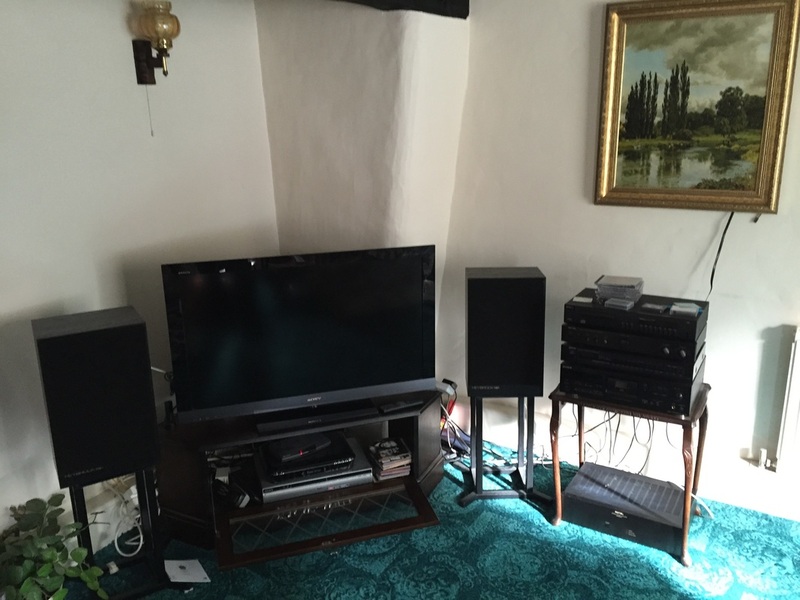 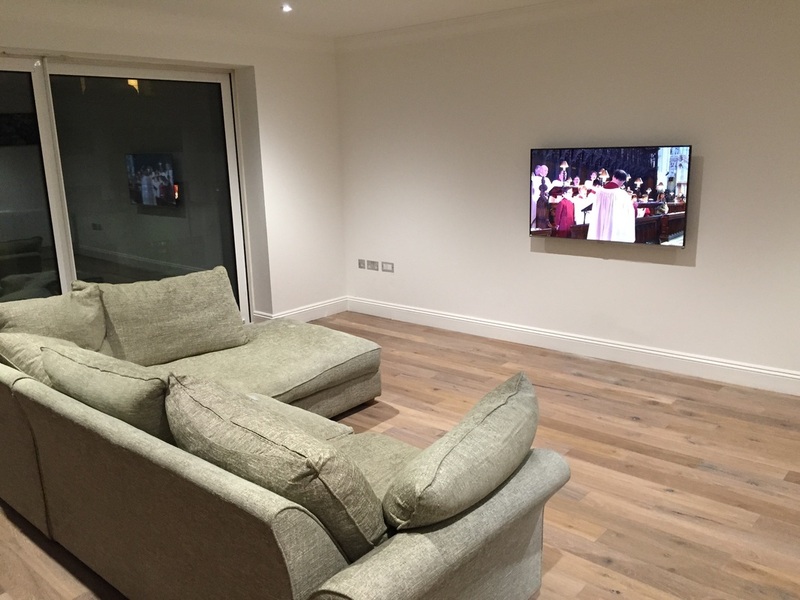 The lounge install was part of a full flat renovation whereby Sky and audio were distributed to other rooms via cat 5 cable and in ceiling speakers. 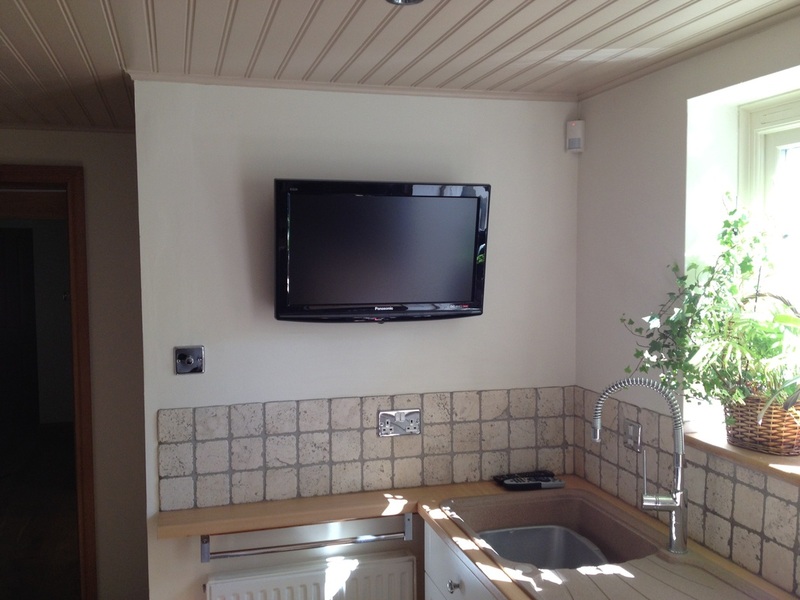 A custom installation of a 22" LED Bathroom Tilevision TV with mirror surround with access to freeview aerial signal or Sky HD distributed from an AV rack. 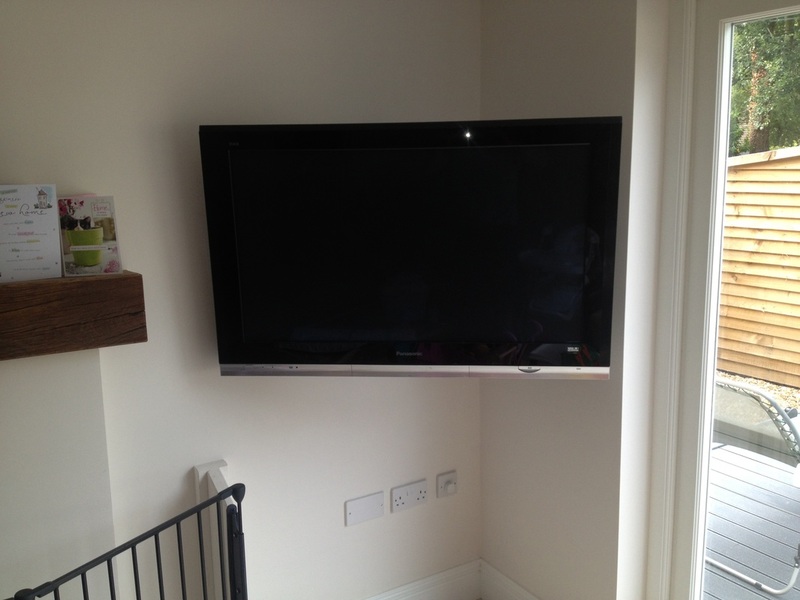 TV installed during renovation of bathroom in conjunction with builders. 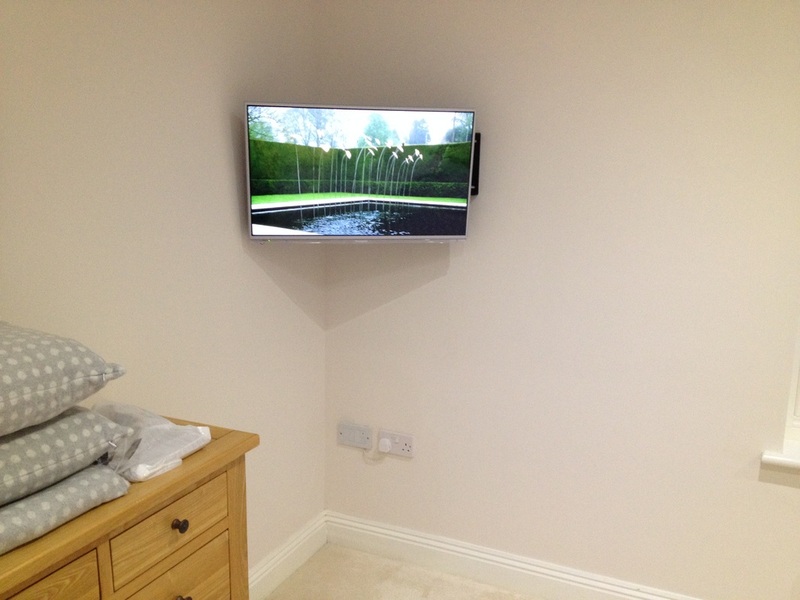 A custom wall mounted 70" Sharp LED TV recessed within wall on Future Automation pull out and swivel wall bracket. 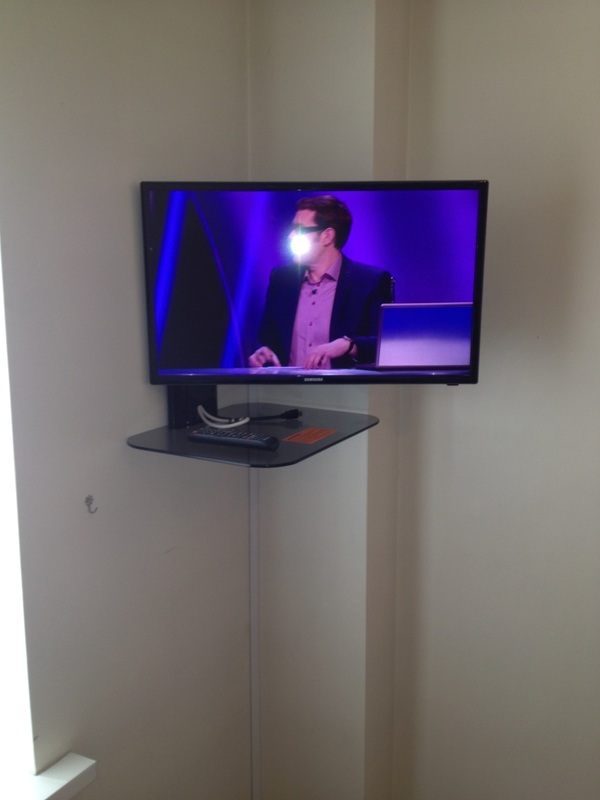 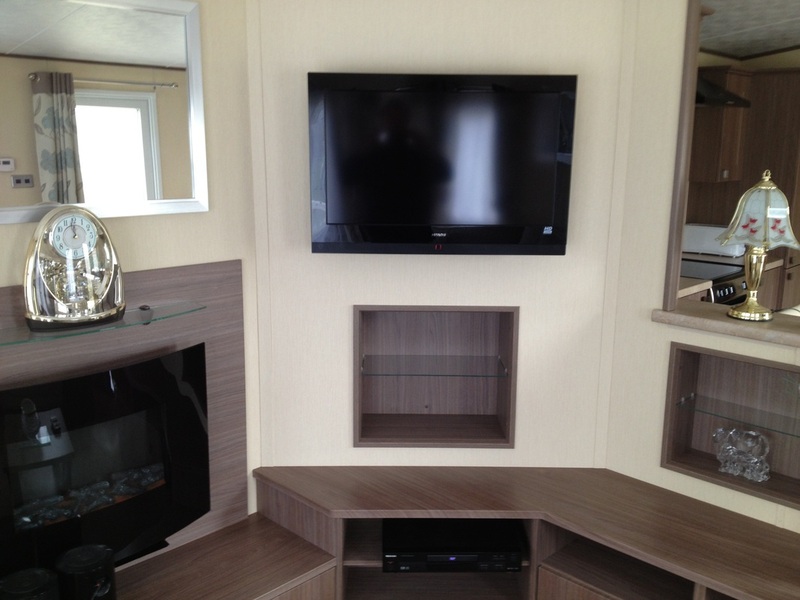 TV able to display Sky HD, Freeview and Blu Ray from equipment rack located 40m away in services room. Installation consisted of supply of pull out bracket, Sky eye to enable control of Sky box, High Definition over cat 5 distribution system, to terminate cat 5 cables and aerial/satellite cables to install bracket and set up system fully, total price £820.00. 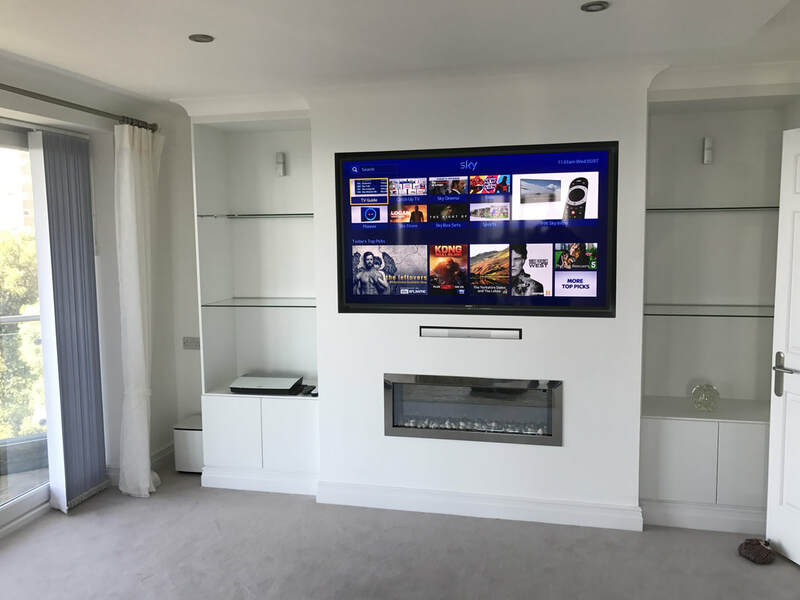 This was part of a larger system completed in stages including a full aerial and satellite distribution system in HD to all rooms, in ceiling speakers in all rooms connected to a Sonos distributed music system, a projection system in games room and a full rack system to house all equipment. 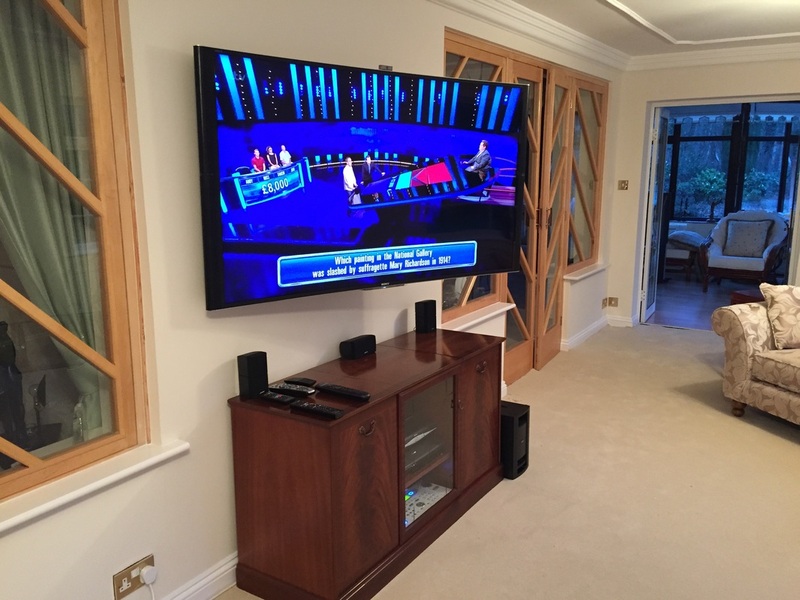 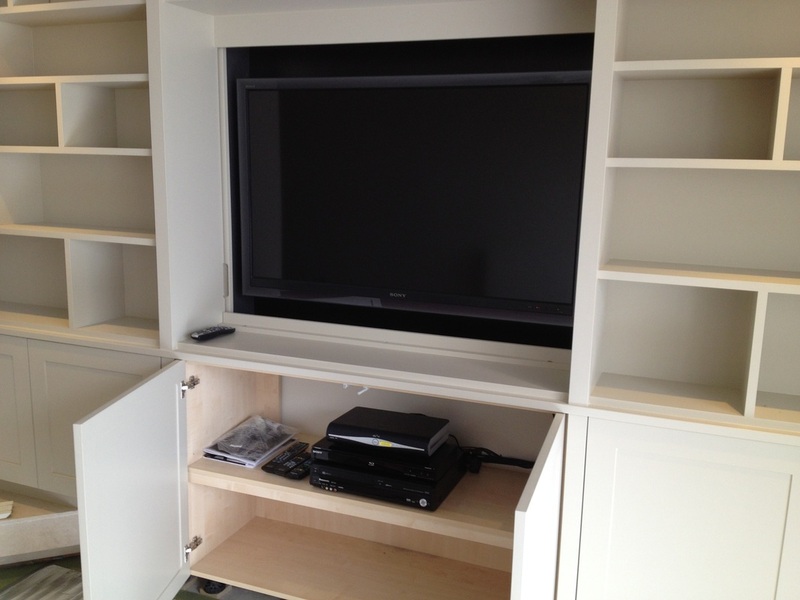 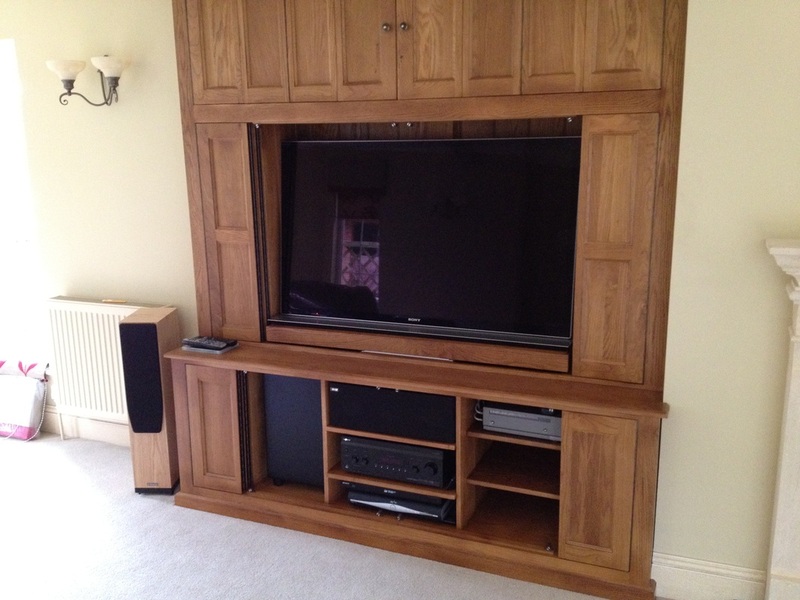 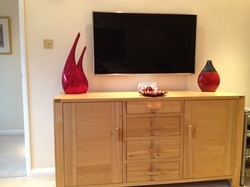 A Sony 52" LED TV mounted on Future Automation pull out and swivel bracket fixed within custom built cabinet housing. 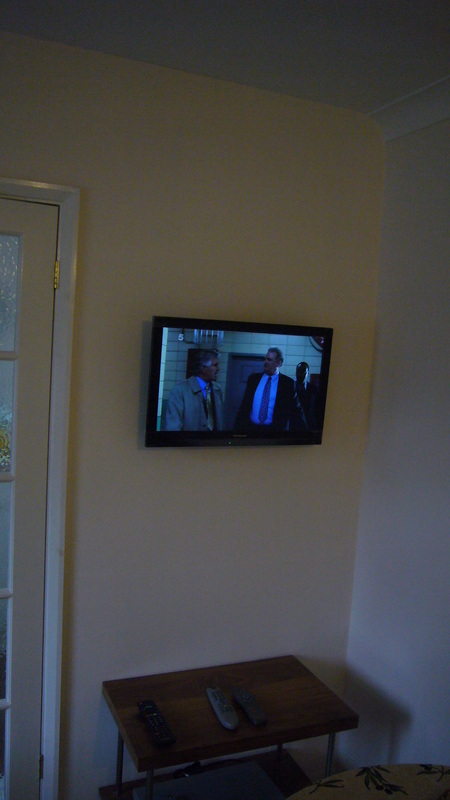 Sky box and DVD connected and hidden within cabinet below TV. 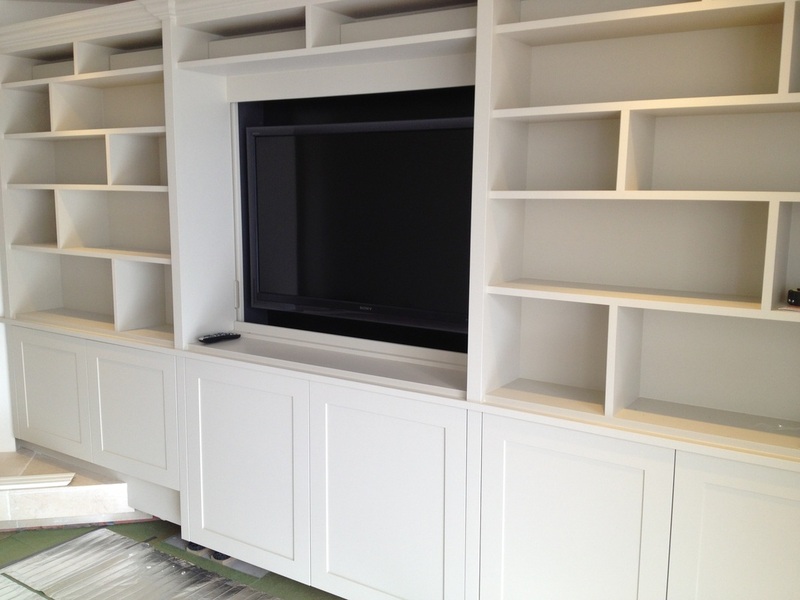 Custom cabinet door to hide TV when not in use. 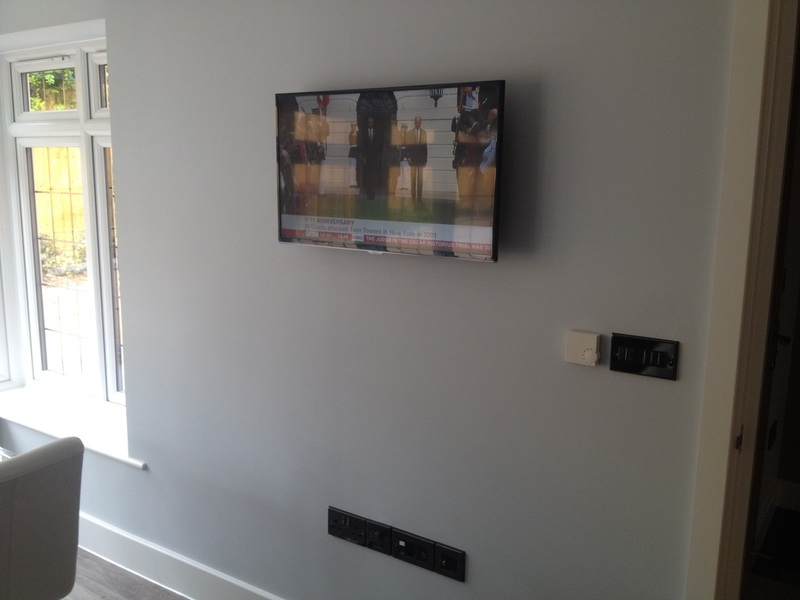 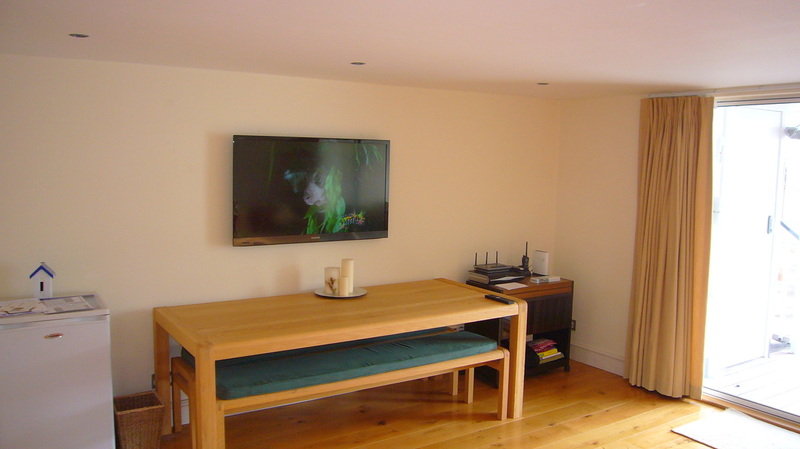 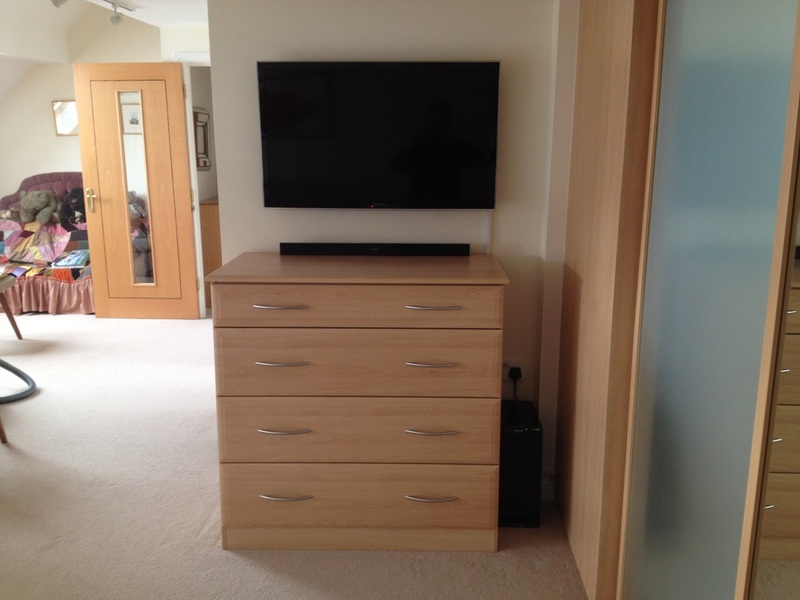 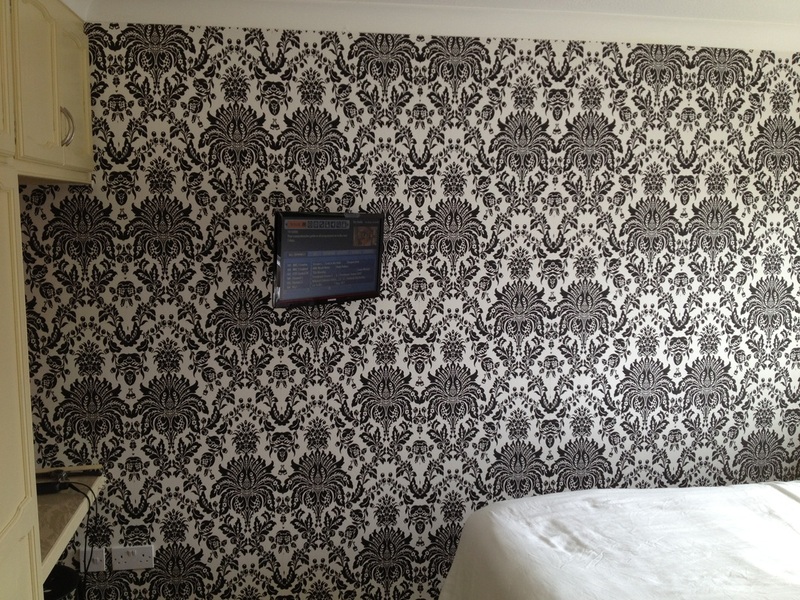 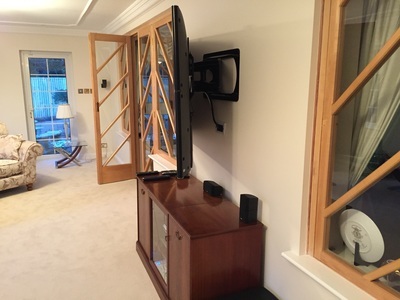 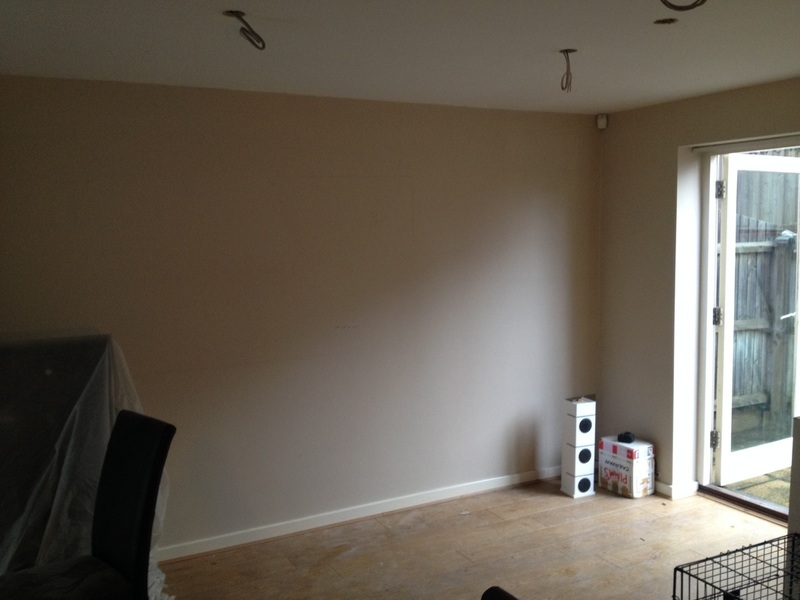 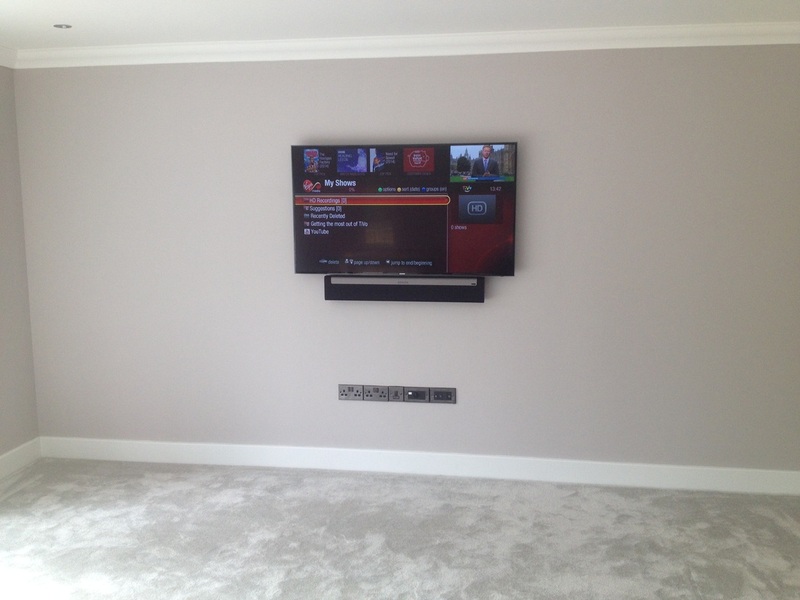 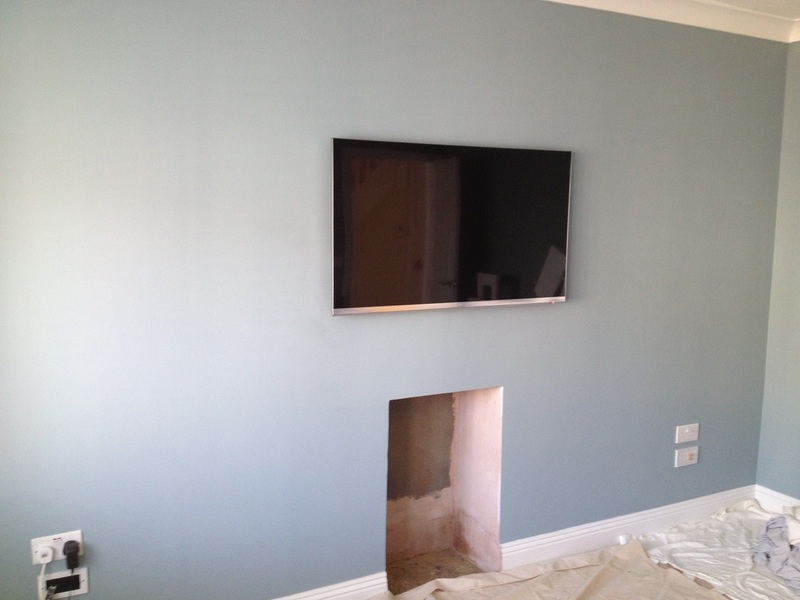 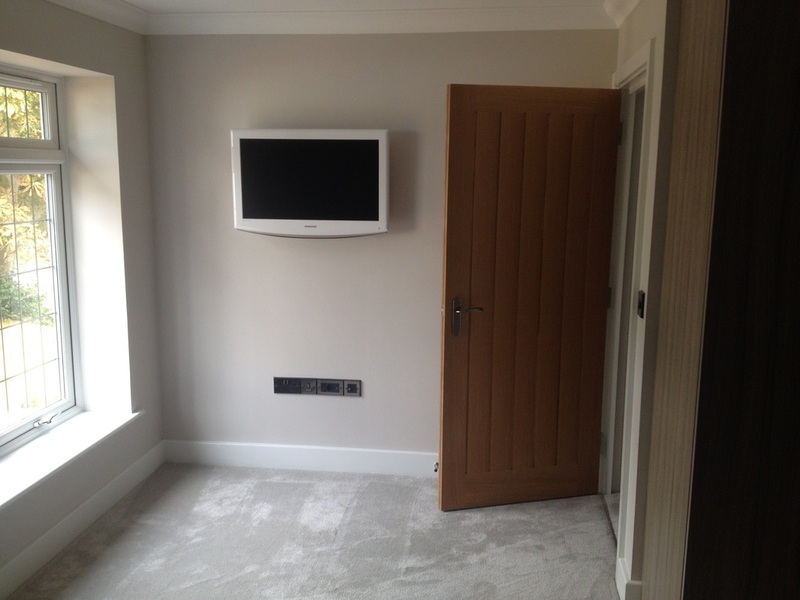 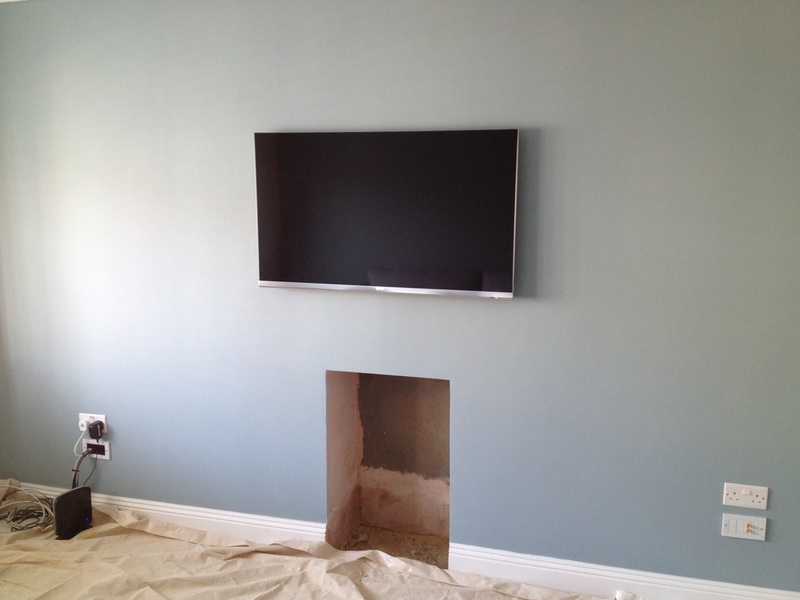 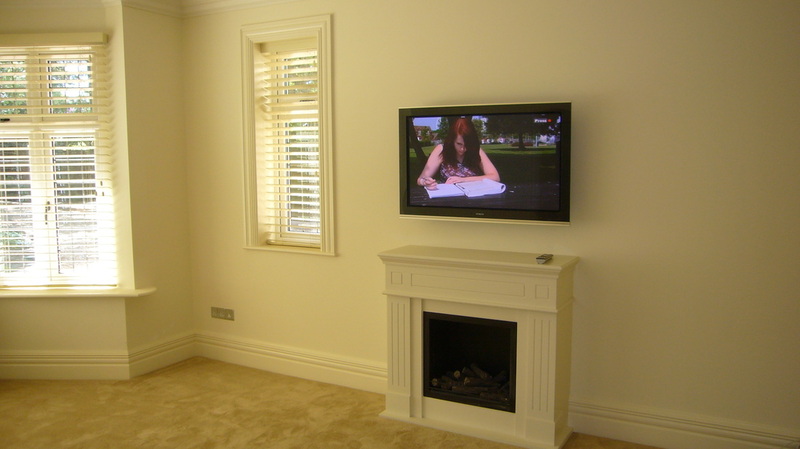 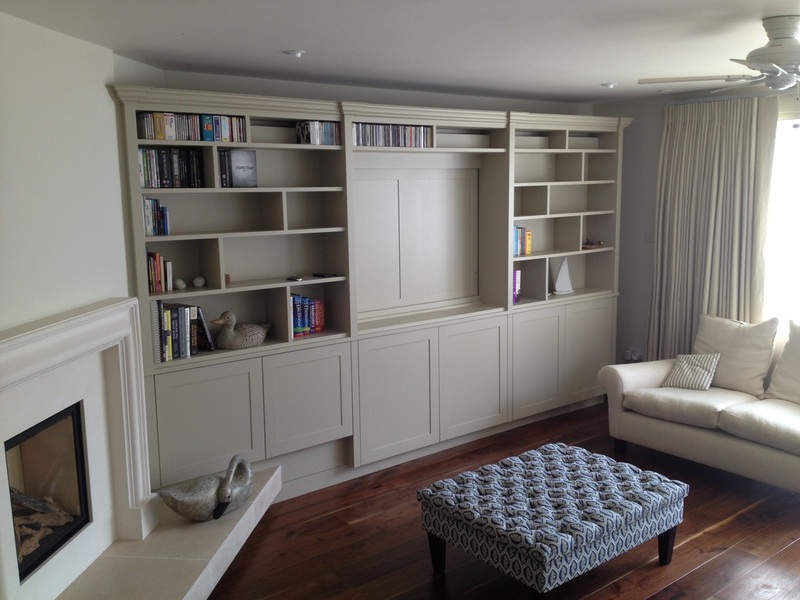 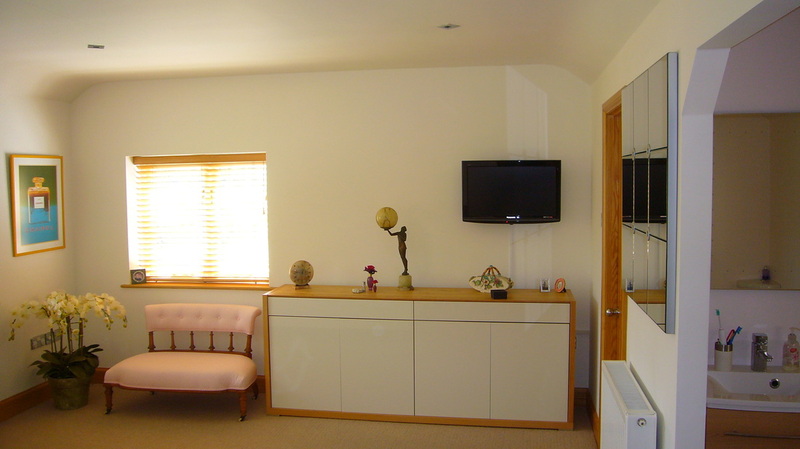 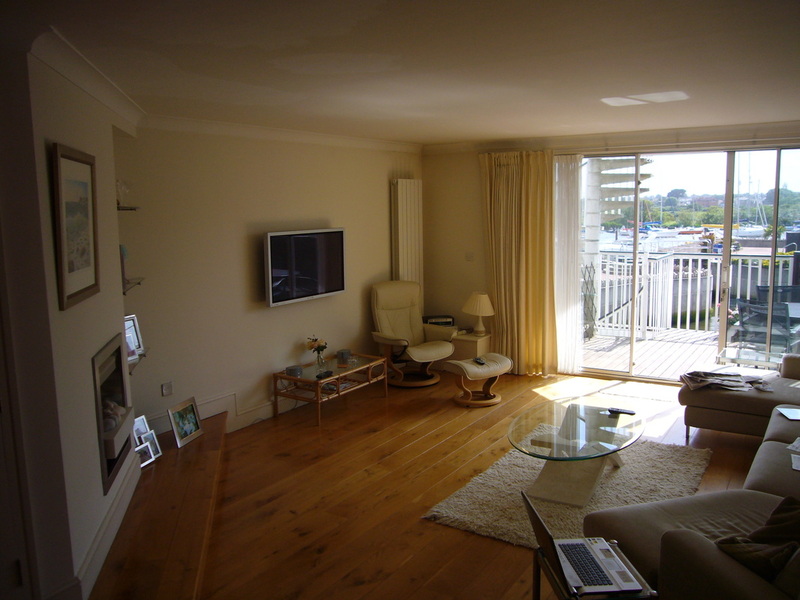 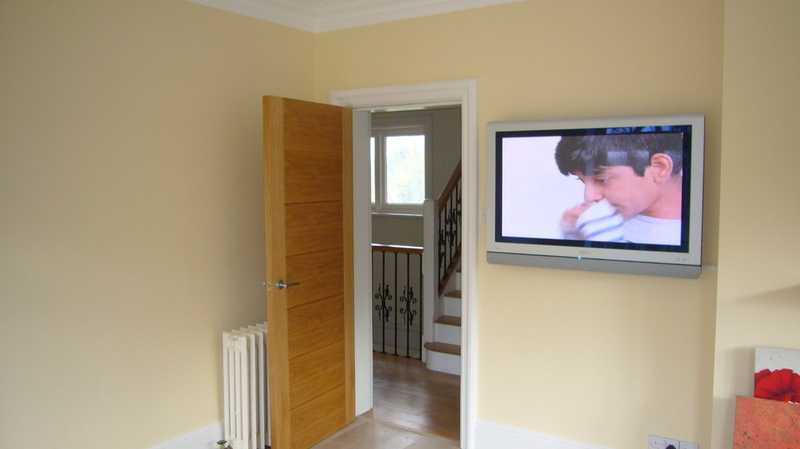 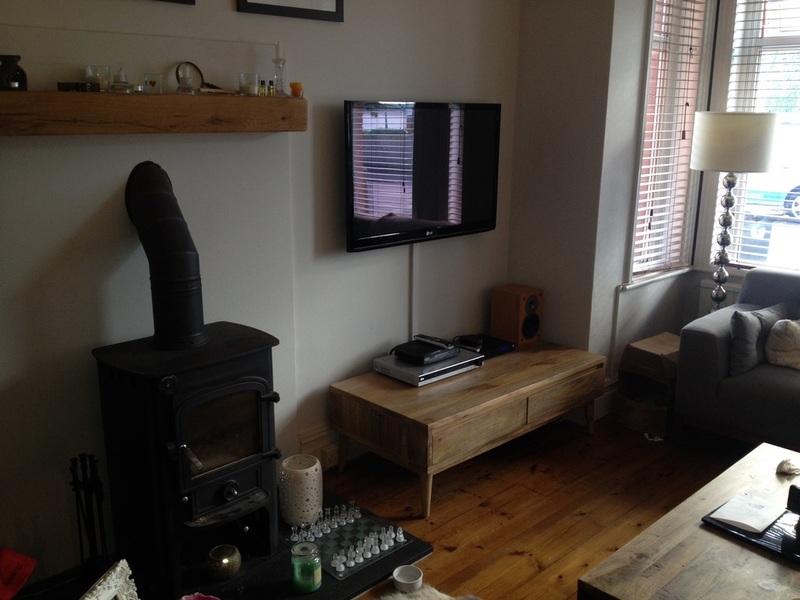 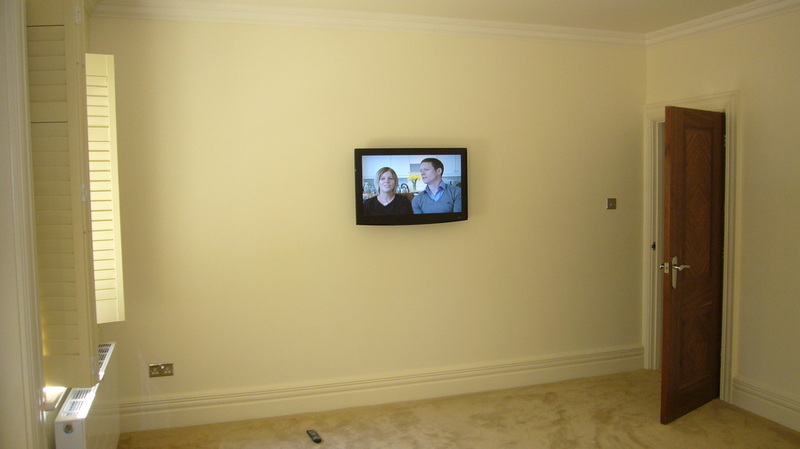 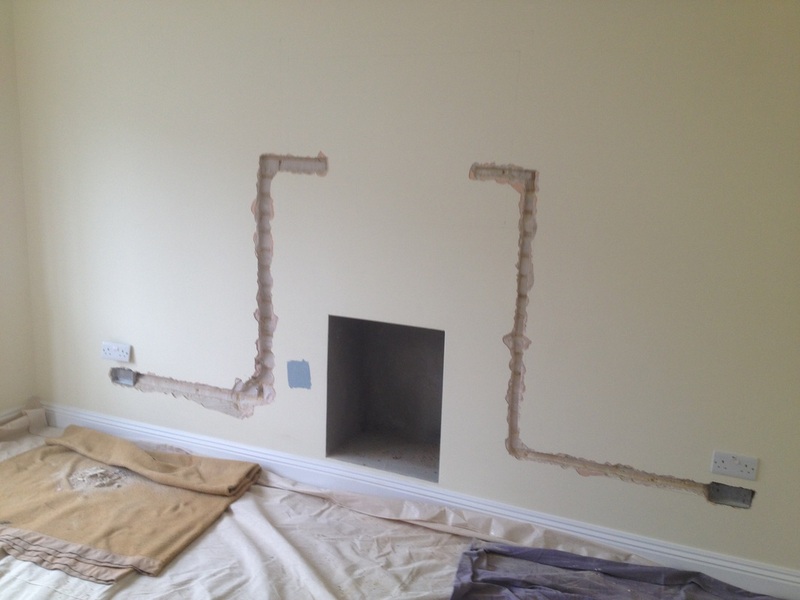 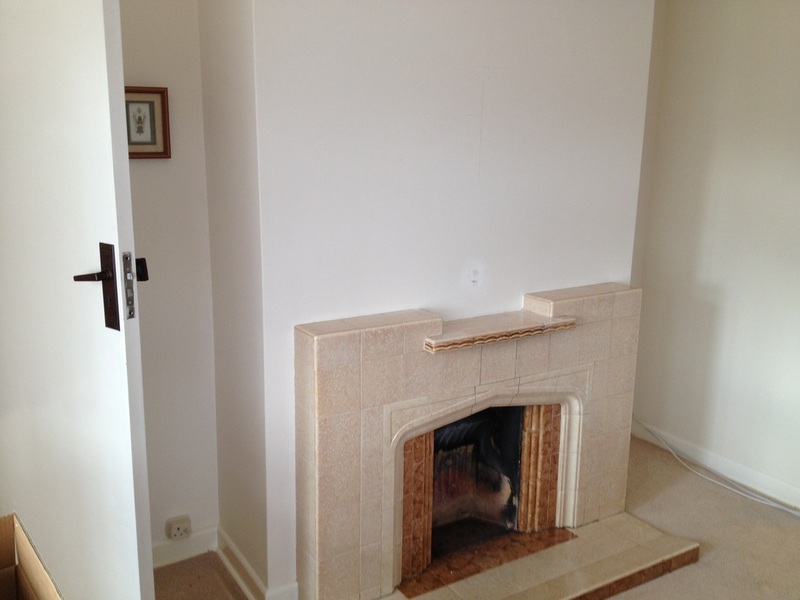 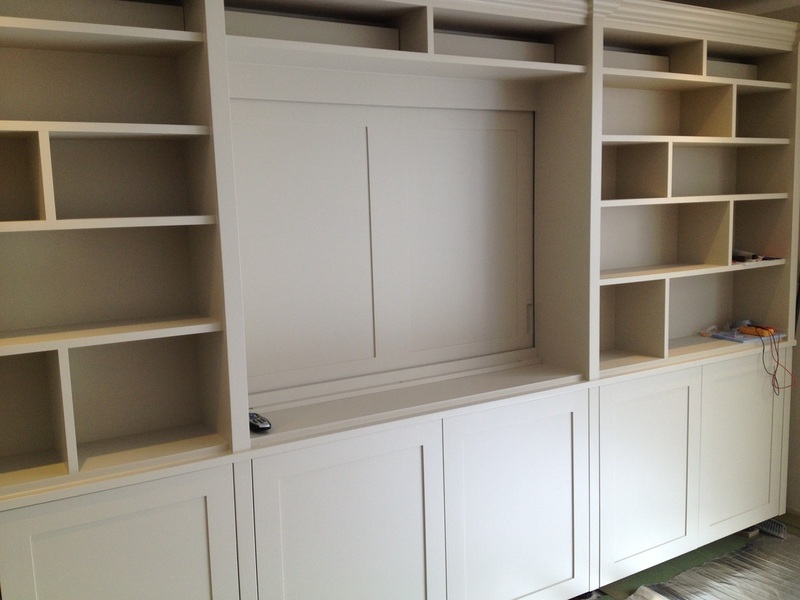 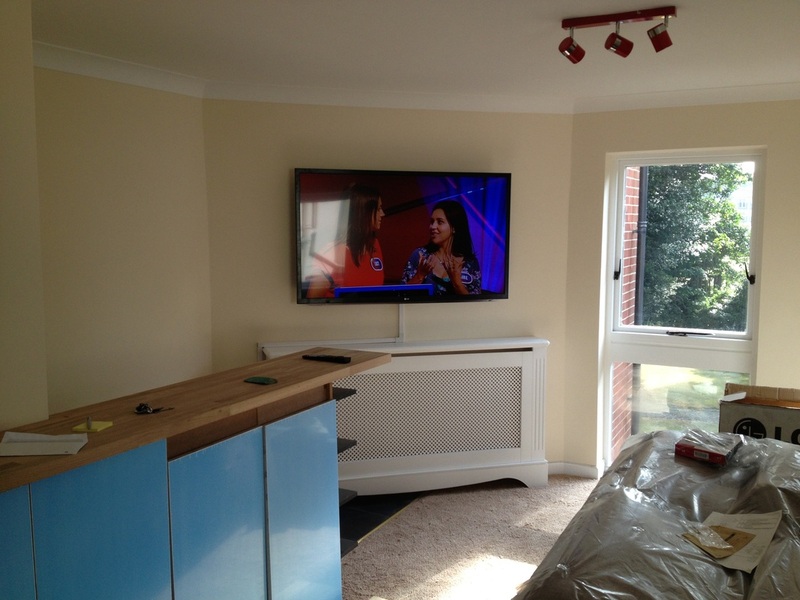 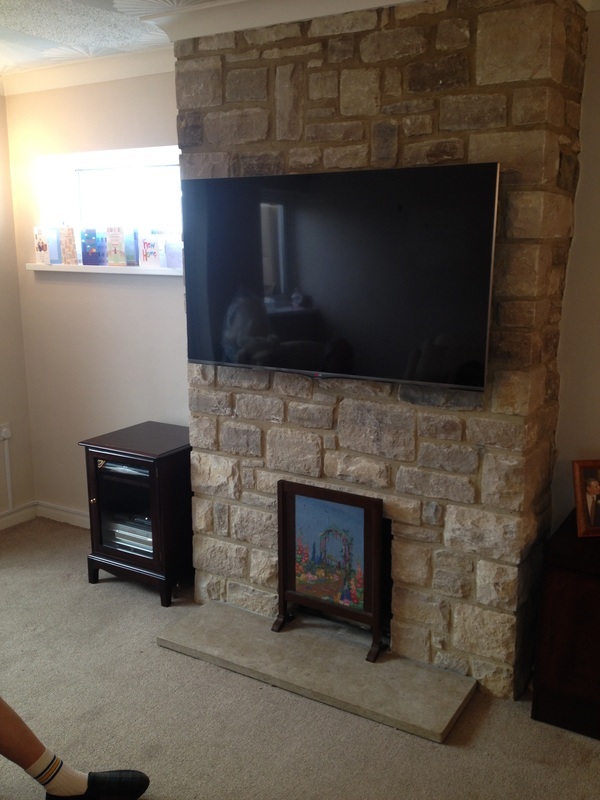 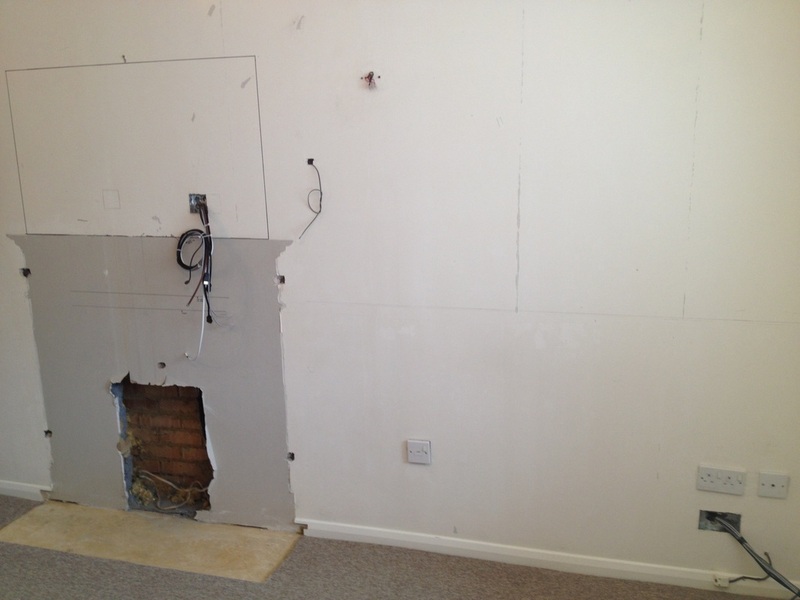 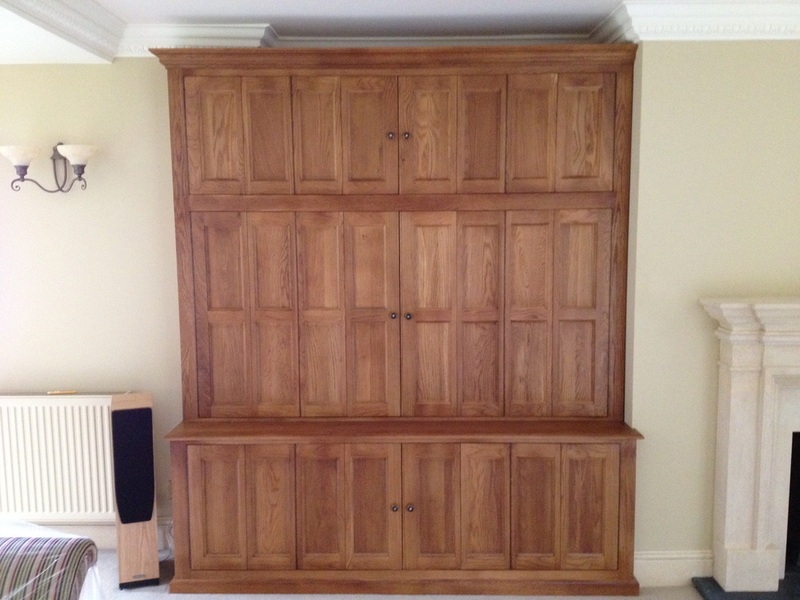 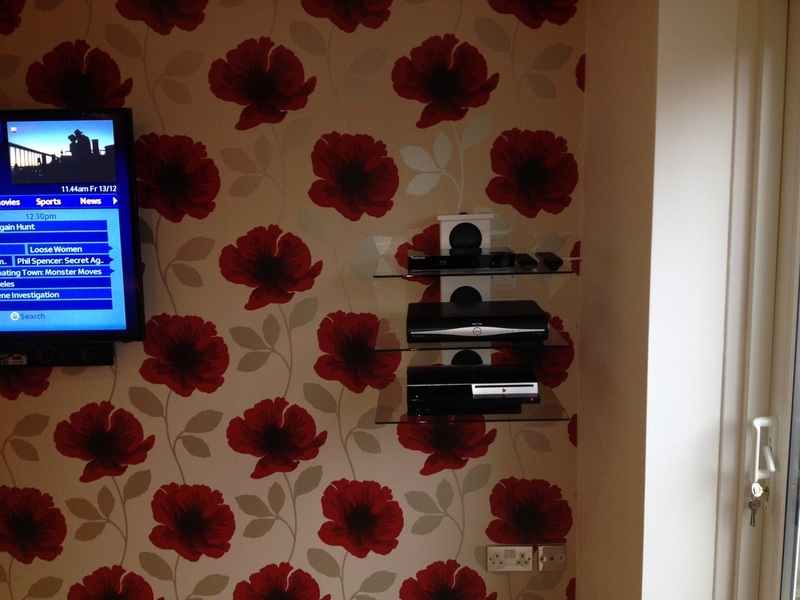 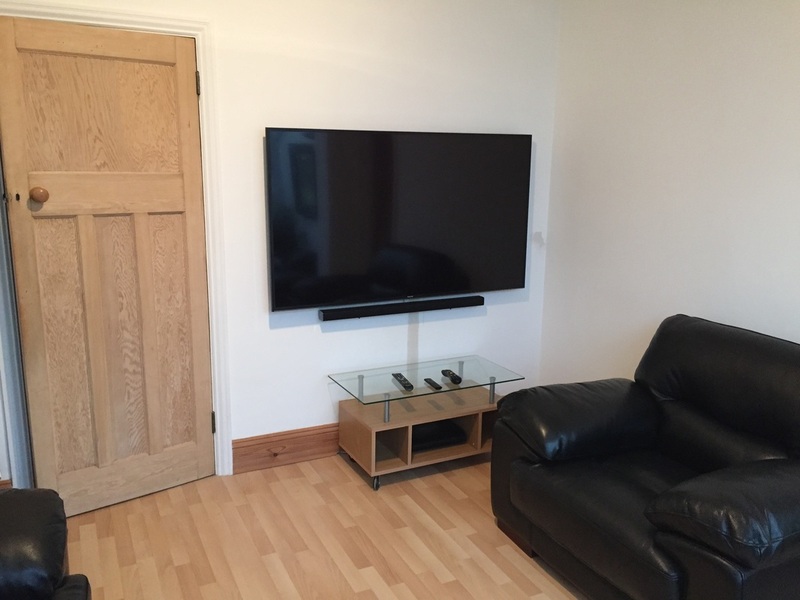 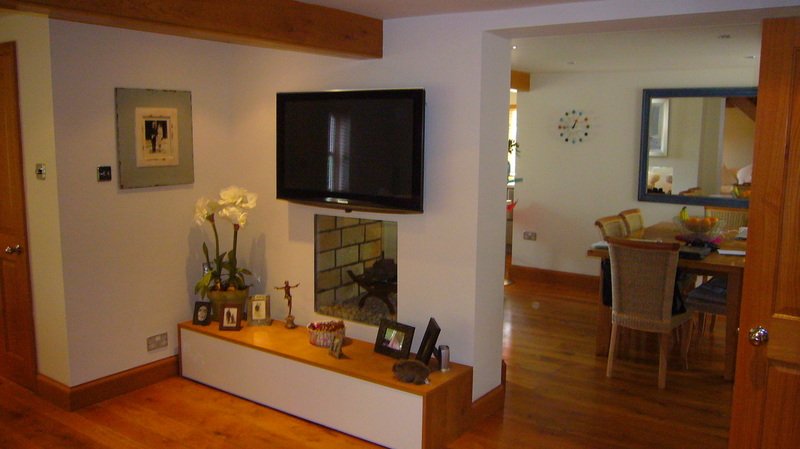 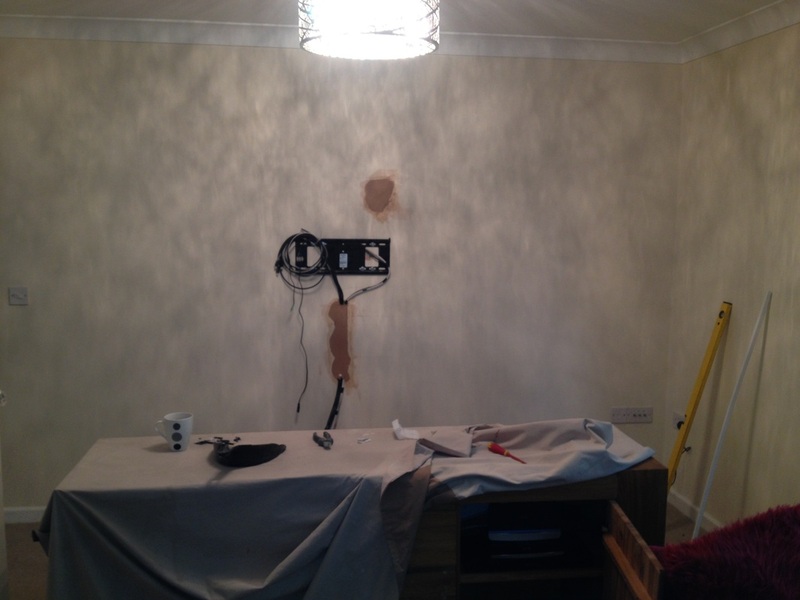 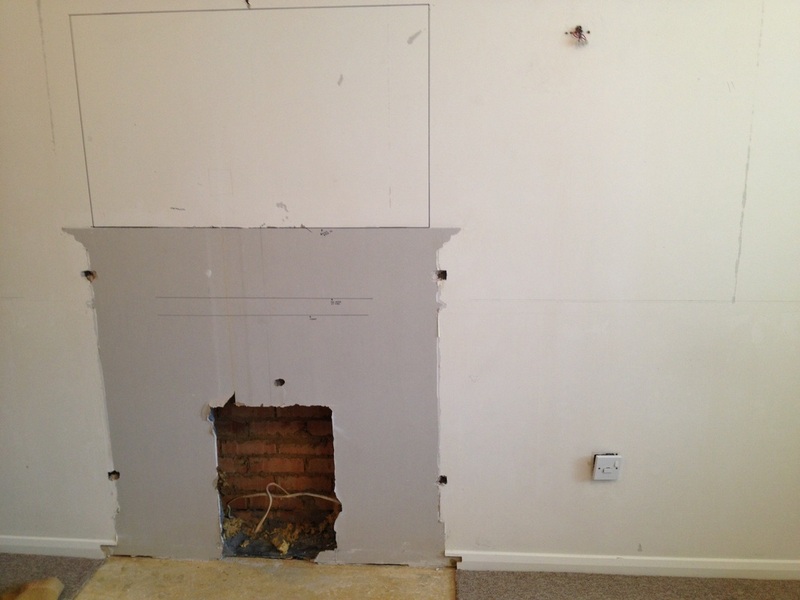 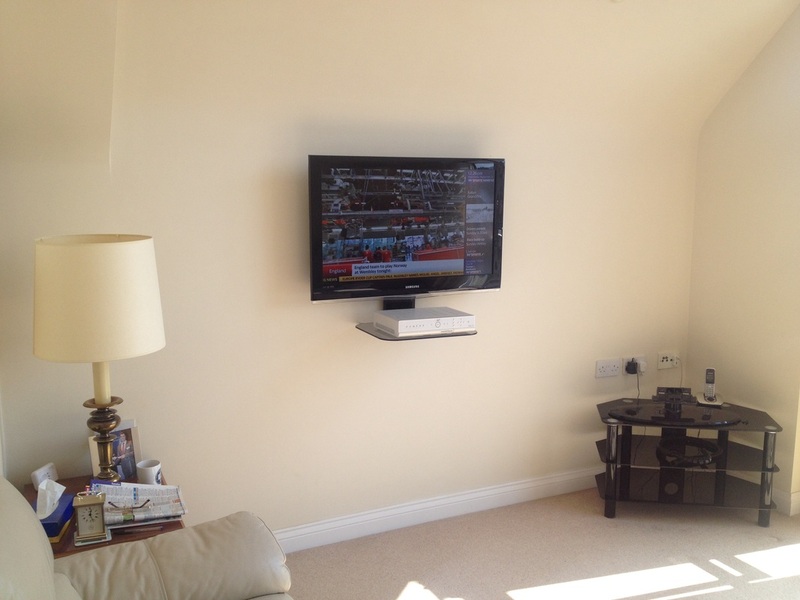 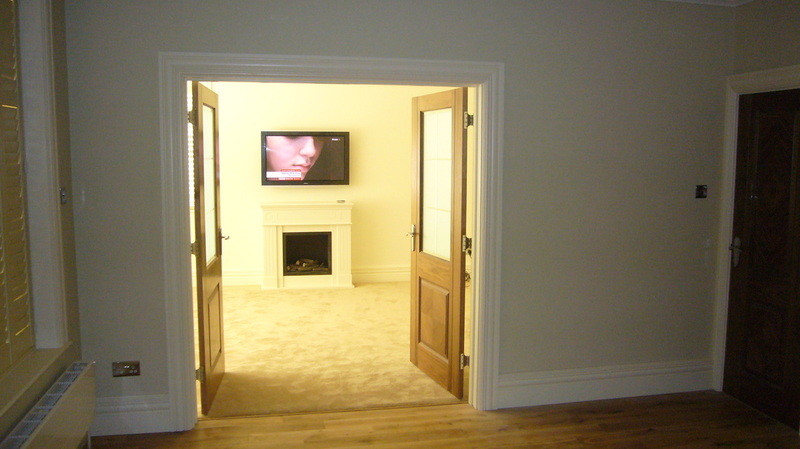 Installation consisted of visiting property to remove previously wall mounted TV and store during refurbishment. 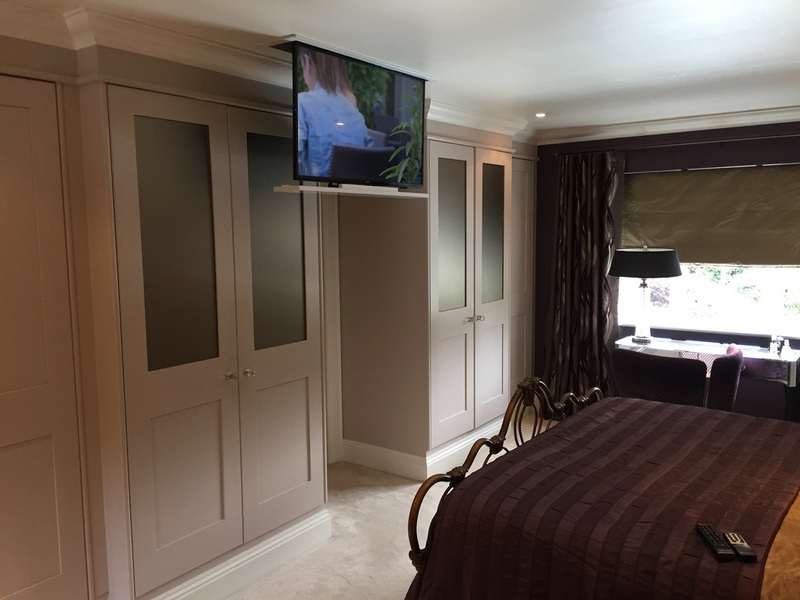 To install 2 x 3M HDMI leads, Sky eye to allow Sky control, custom pull out and swivel bracket, tinstall 2 x telephone points and set up Sky to be able to work in other rooms, to wall mount TV and set up system fully, total price £710.00. 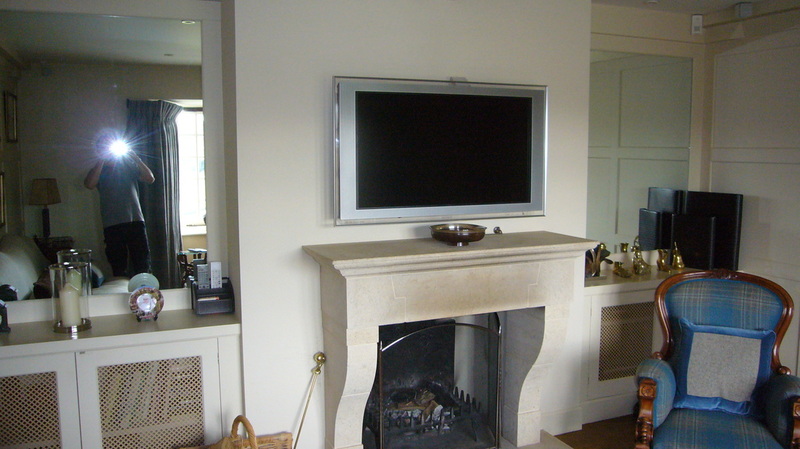 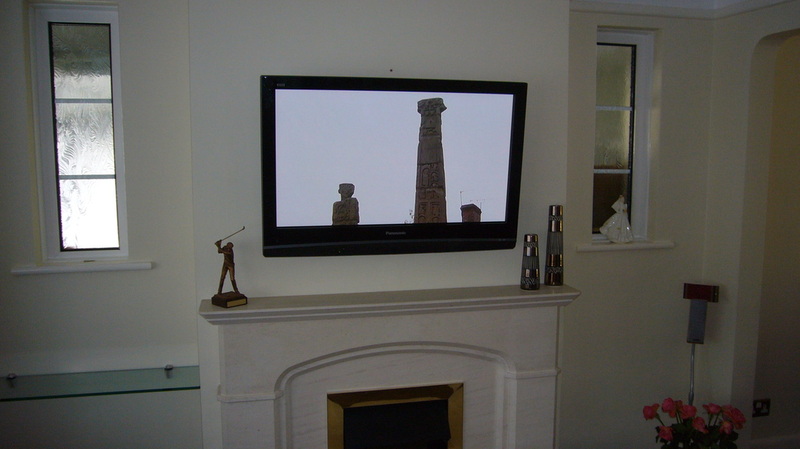 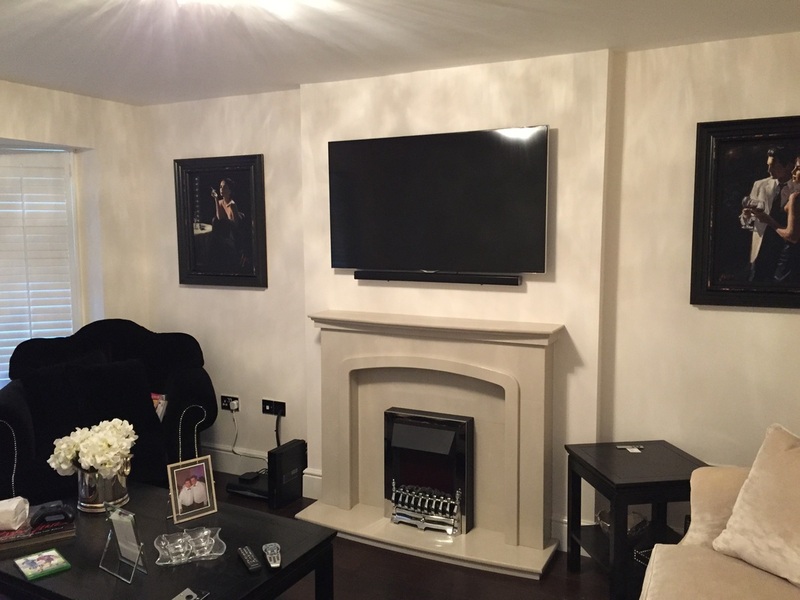 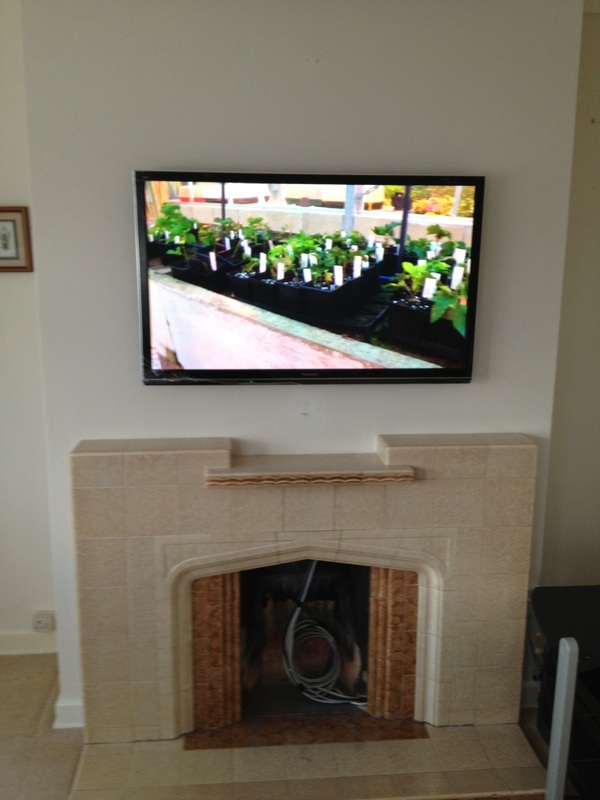 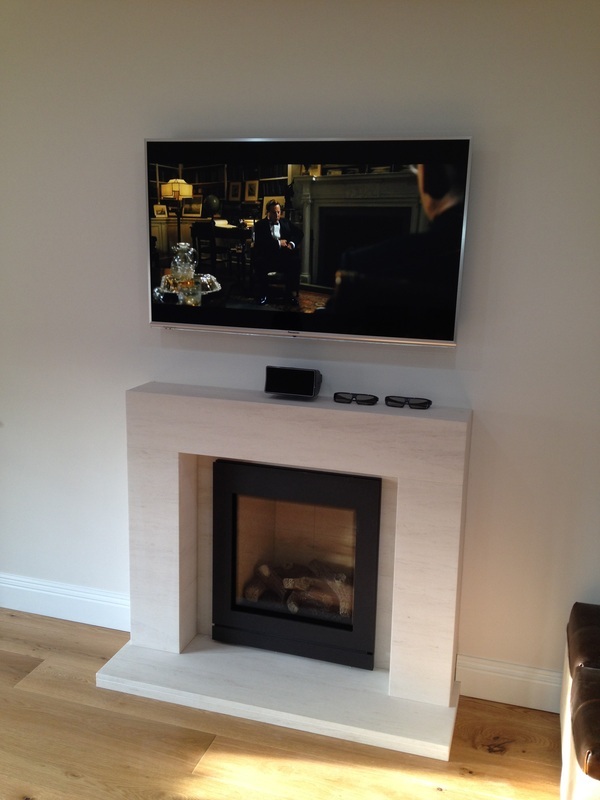 Wall mounting of 55" LG TV on Portland stone fireplace, supply and installation of wall mounting bracket, supply of all cabling run inside chimney flu and out of side of chimney breast to AV equipment rack. 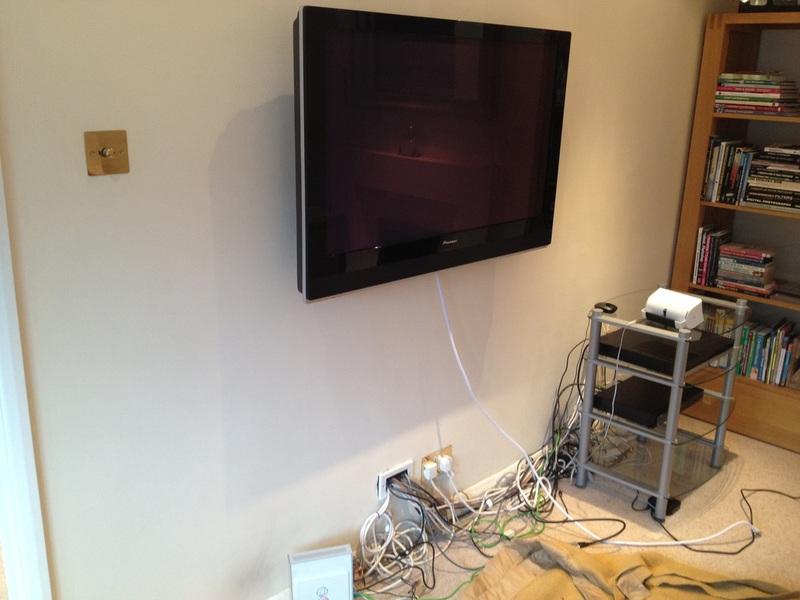 Supply and installation of new hi gain loft mounted aerial and distribution amplifier serving 4 TV points. 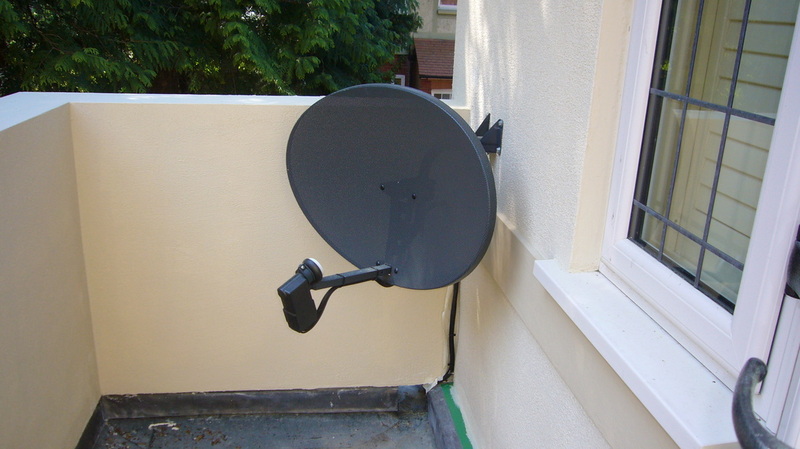 Supply, installation and alignment of new Sky mini dish and quad LNB. 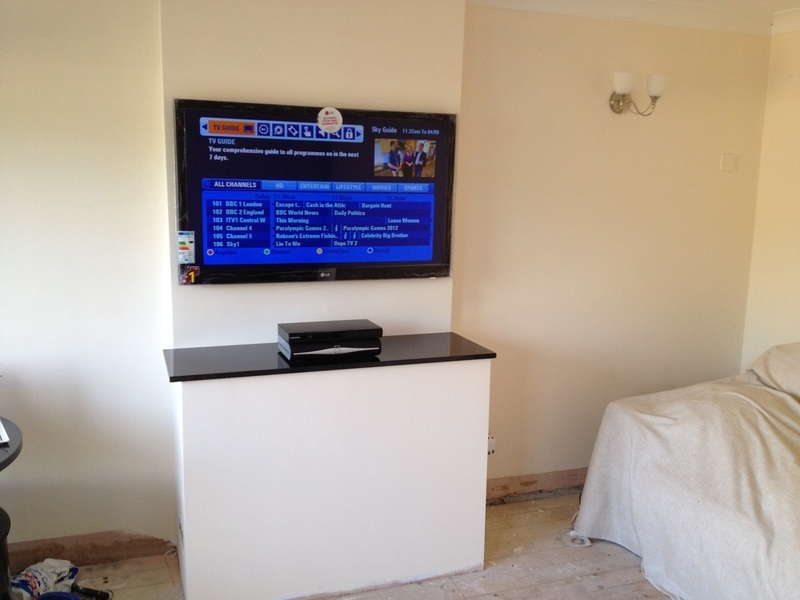 Installation of new aerial point to bedroom. 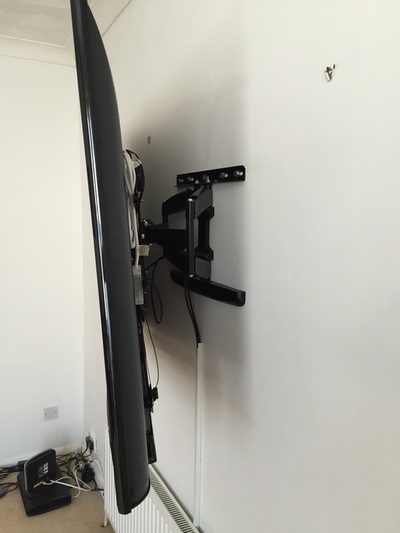 Supply and installation of pull out and swivel wall bracket suitable for 22" Samsung TV. 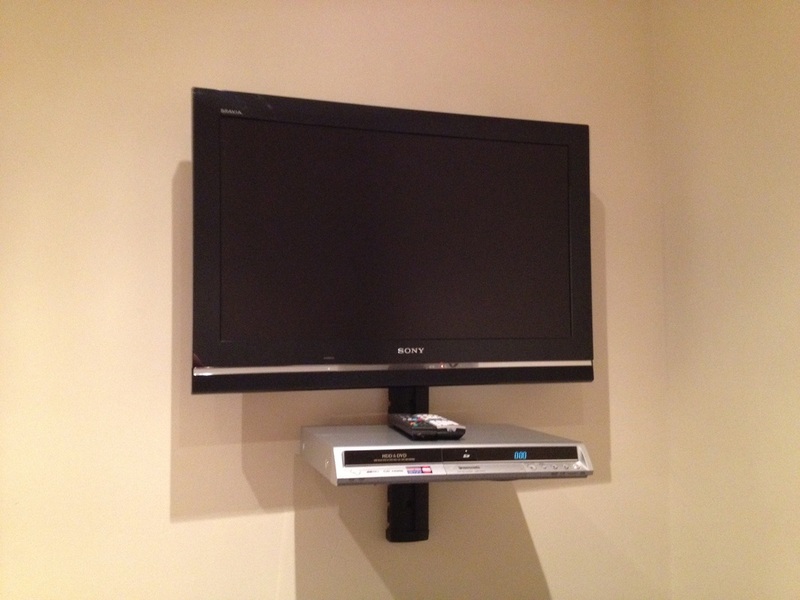 Supply and installation of mounting shelf suitable for personal video recorder. Full set up of all equipment. 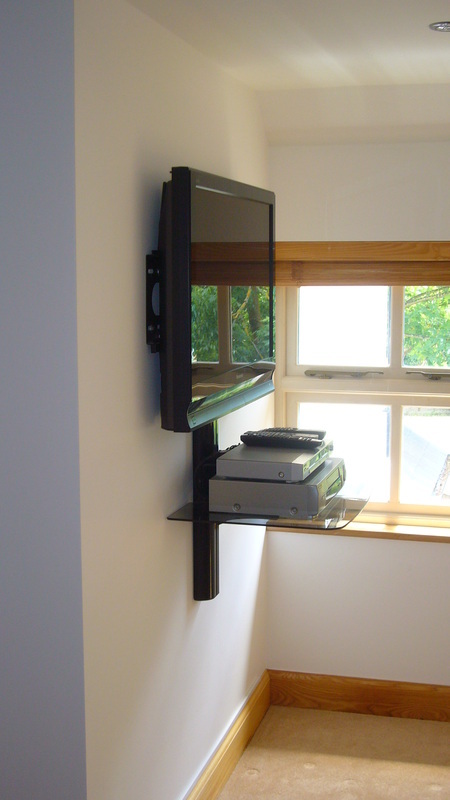 Installation cost including all brackets, cabling and set up - £825.00. 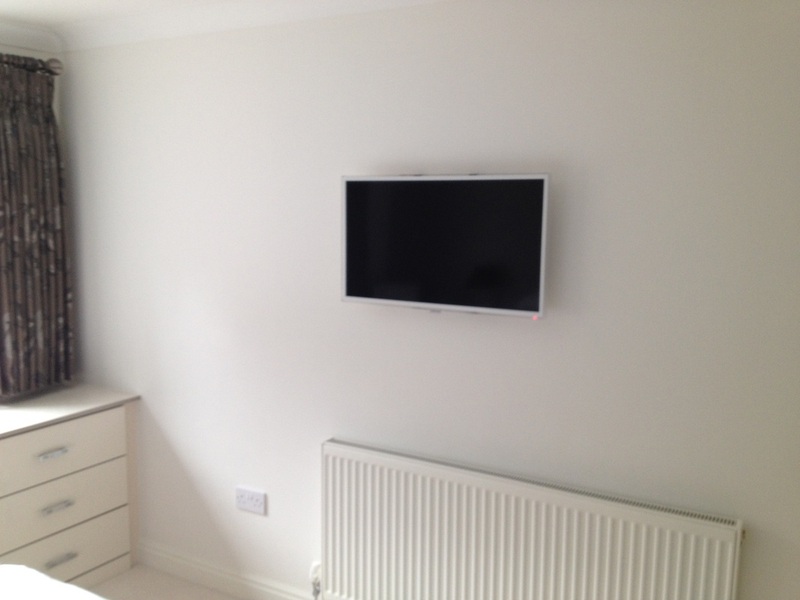 Two 32" Samsung white bedroom TV's wall mounted and linked to a distributed Sky & freeview TV system, cables concealed in cavity wall, installation cost £150 per TV including brackets. 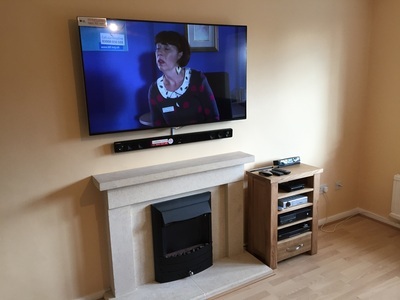 Replacement of a Pioneer 43" Plasma TV with a new LED 47" Panasonic, shorten and tidy of all cabling, replace scart leads with HDMI leads and fully set up new audio system and Internet TV - £295.00. 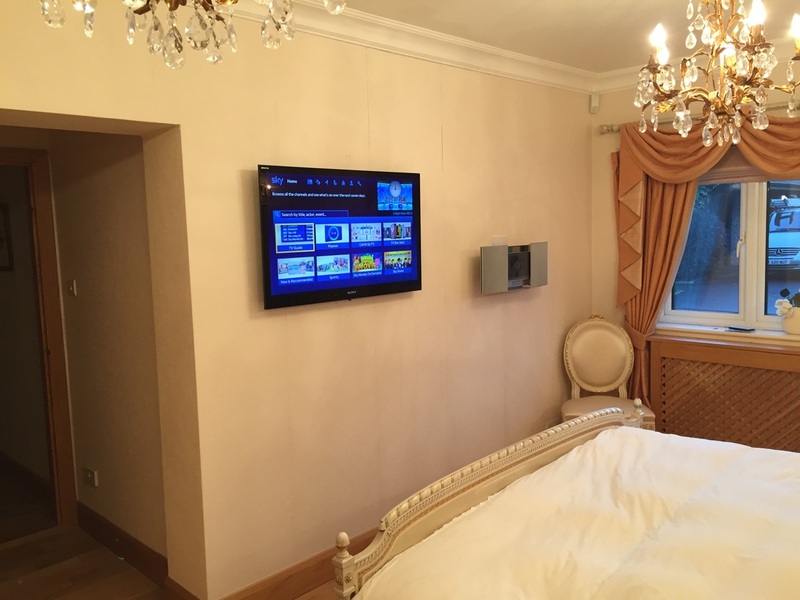 A 46" wall mounted Samsung LED TV in a chalet on a local park, Bracket supplied, all cabling hidden within wall, Sky box and blu ray player linked to TV and distributed to other rooms. 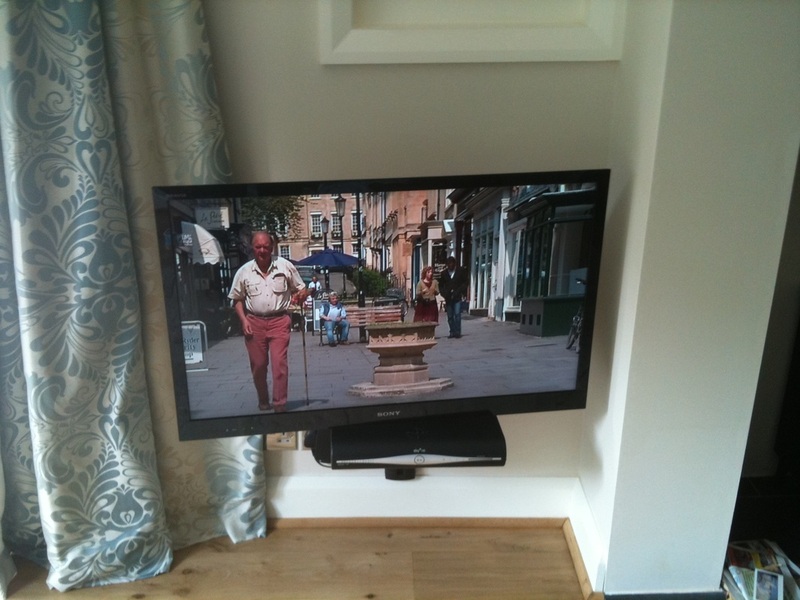 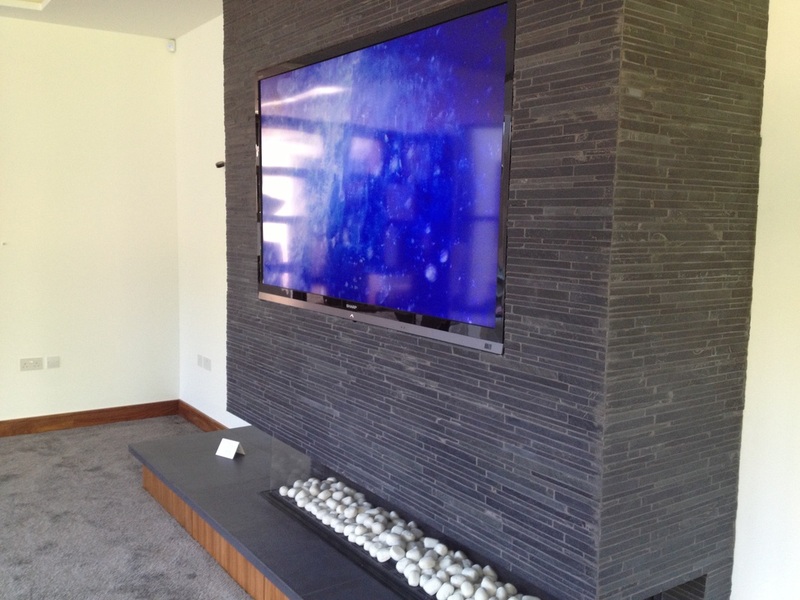 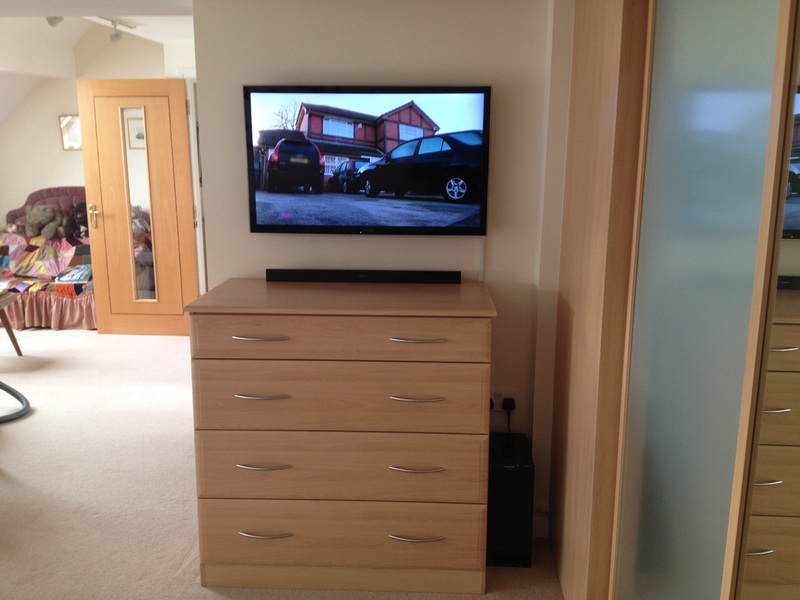 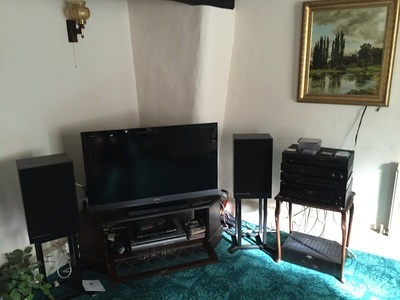 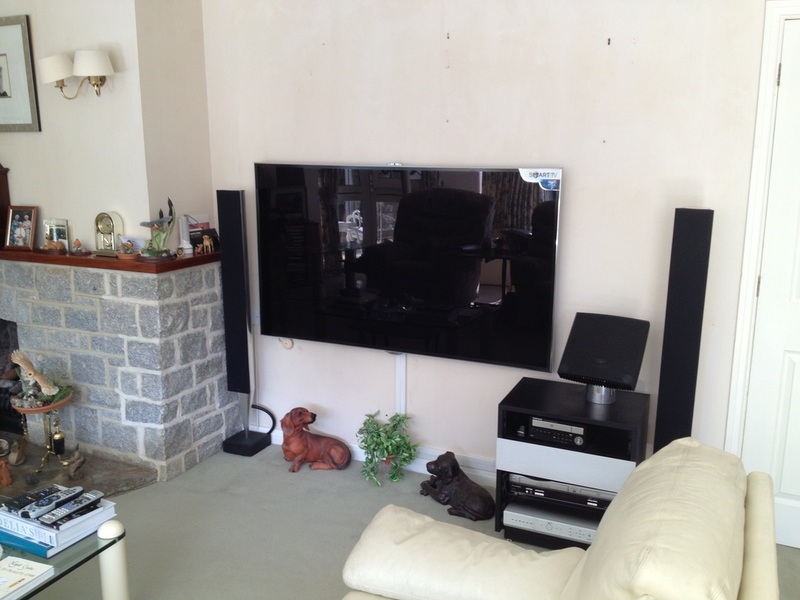 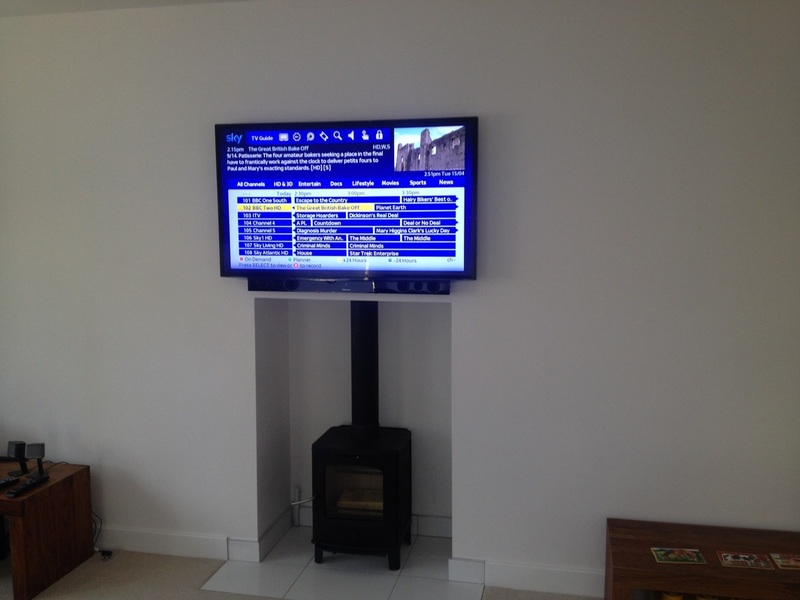 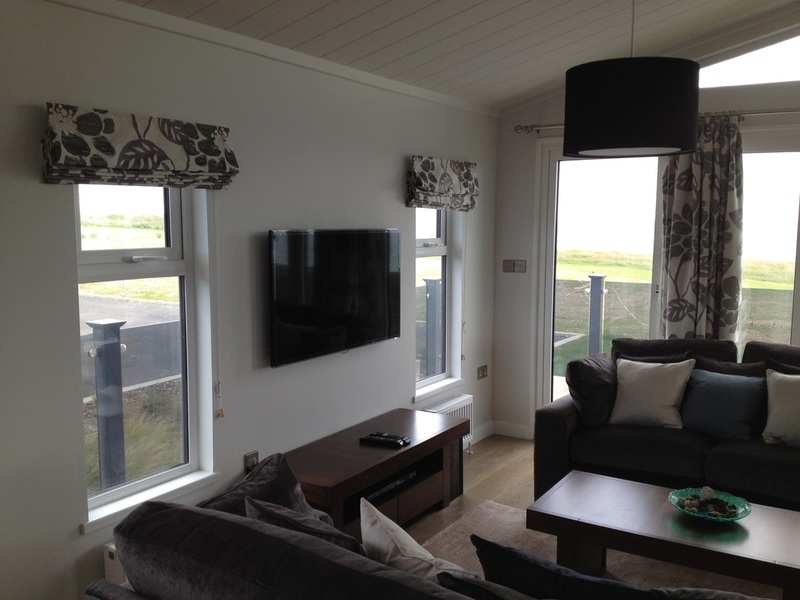 Total price of installation including flat to wall bracket, 5m HDMI leads and installation £220.00. 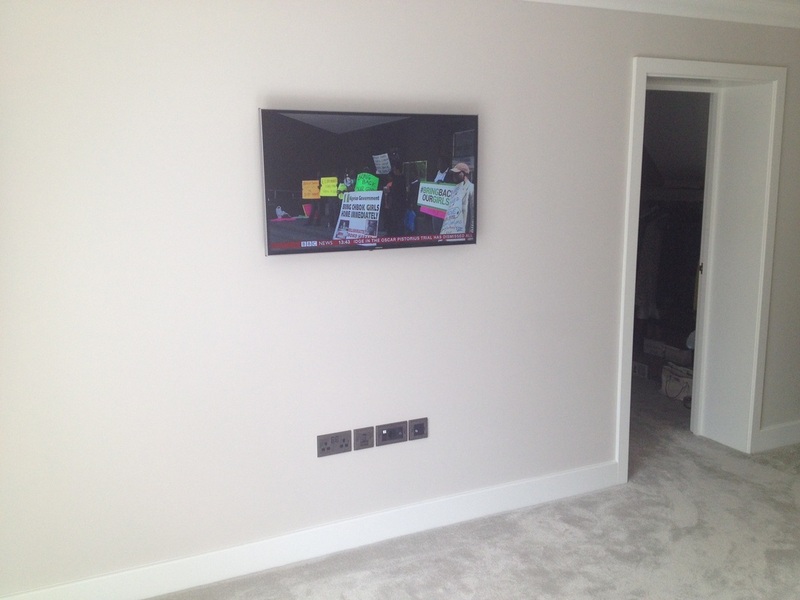 An LG 55" LED TV wall mounted on customer supplied pull out and swivel bracket, cabling hidden within surface mounted mini trunking. 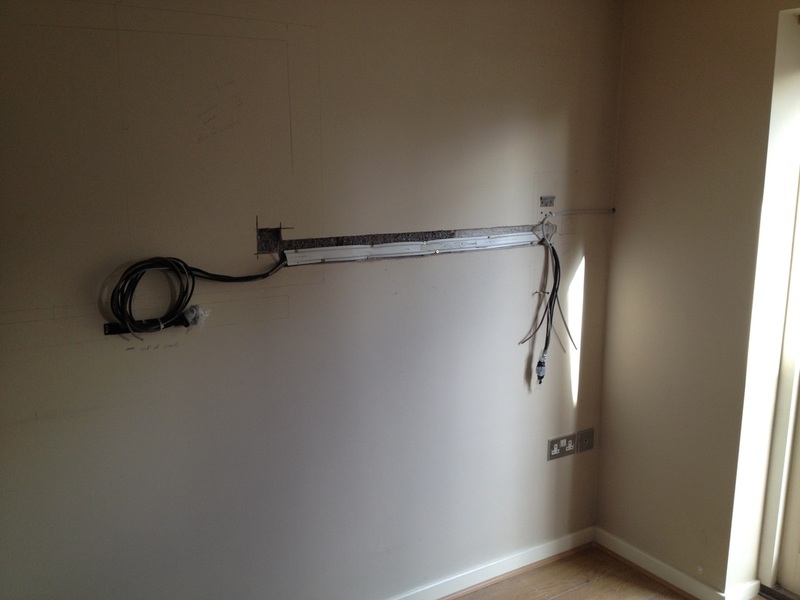 White aerial cable clipped around outside of room along skirting board to aerial socket on opposite wall. 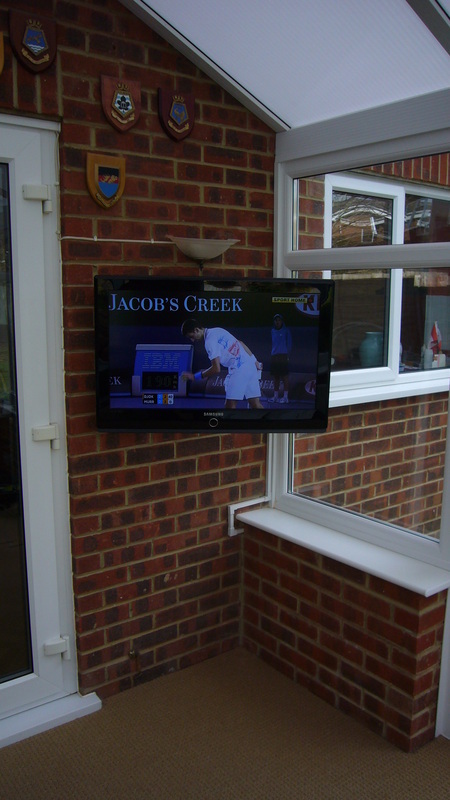 Total installation cost - £120.00. 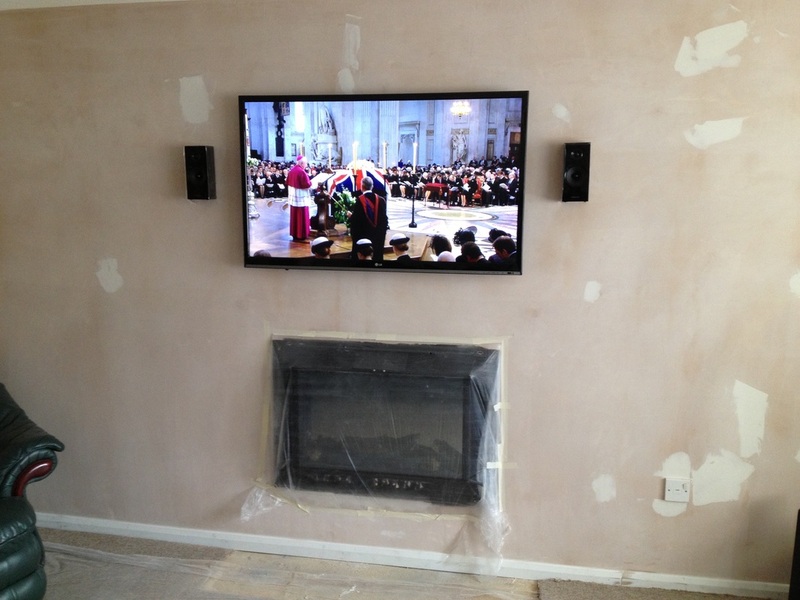 Supply and installation of Panasonic 3D 47" LED TV with all cabling chased into the wall, part of a larger lounge home cinema set up consisting of Sky HD, Onkyo amplifier powering 5 Jamo on wall speaker and subwoofer, Panasonic Blu ray Player, Total installation cost including supply and fitment of all products £2200.00. 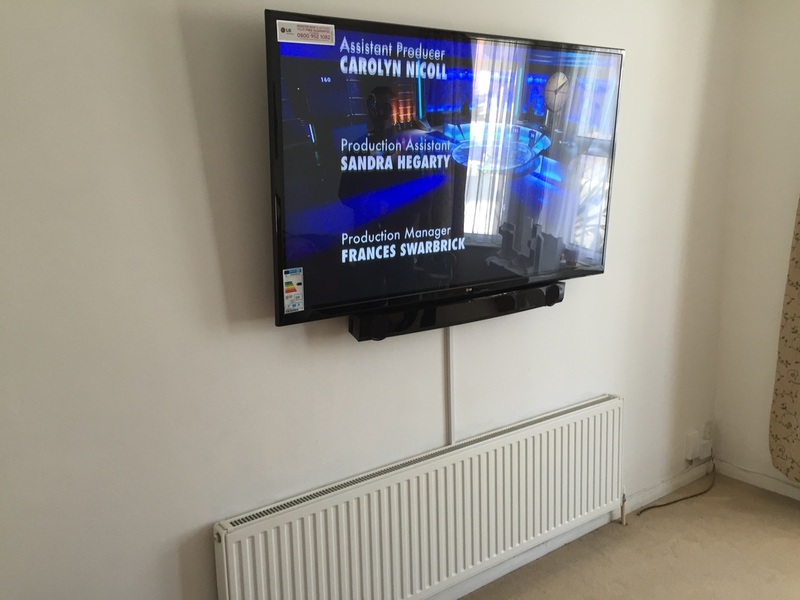 Installation of 48" Samsung LED TV in a flat refurbishment, supply of flat to wall bracket, new mains lead and required aerial cabling, Total cost - £150. 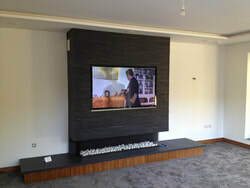 A two part installation to work with builders / bespoke furniture designers to build a new cabinet in lounge to accommodate a new 46" Samsung LED curved screen. 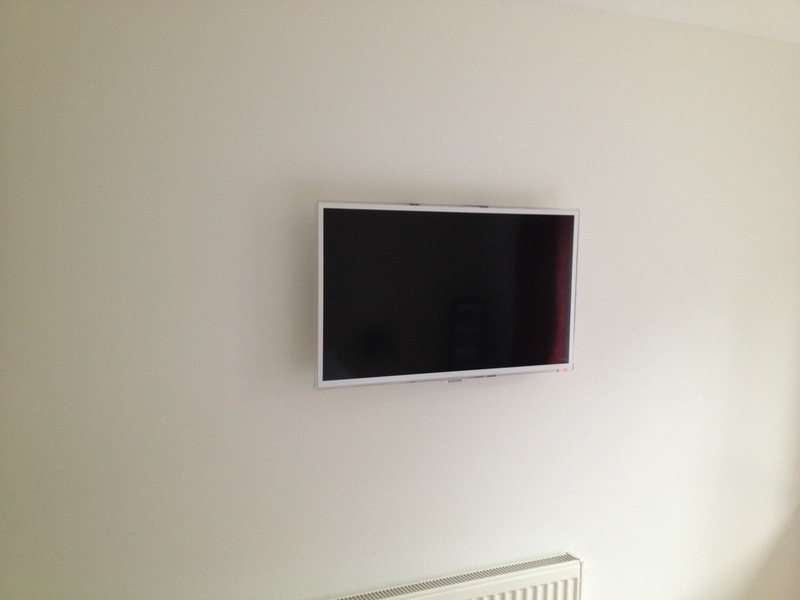 To then move previous Sony 46" LED TV and install on bedroom wall. 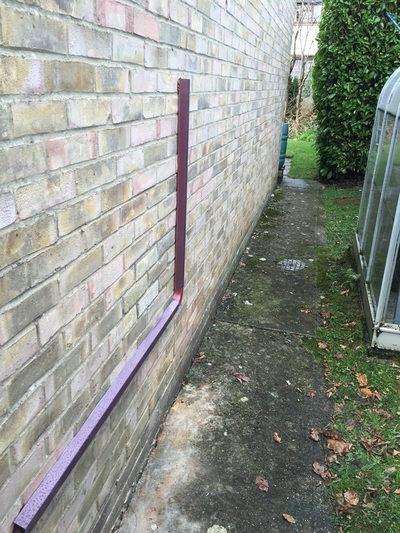 As part of the installation Sky had to be set up to be distributed around the house in high definition, aerial system had to be upgraded and all cabling had to be consealed.